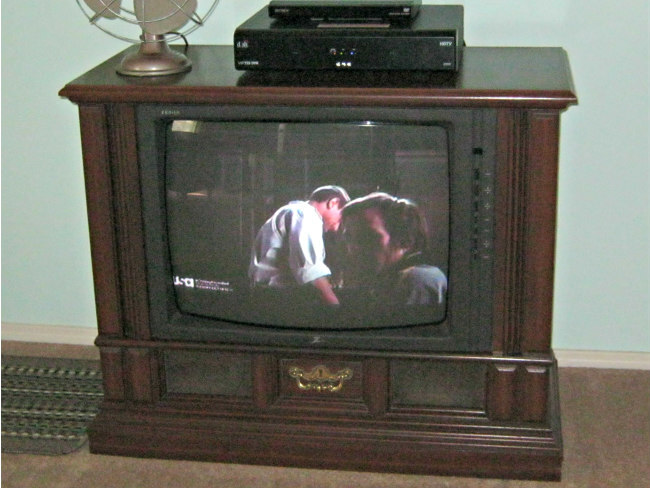 My mom loved her Zenith TV console. Me, not so much. When she died it became mine and, even though I thought it was an eyesore, I kept using it because it still worked. 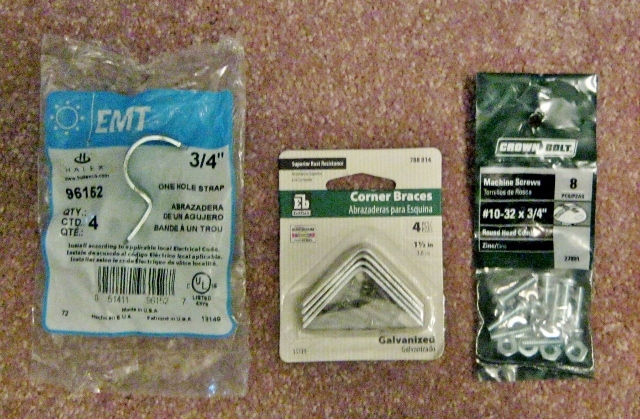 And for the most part I don’t like to get rid of things that are still useful. And that’s another thing I inherited from her. 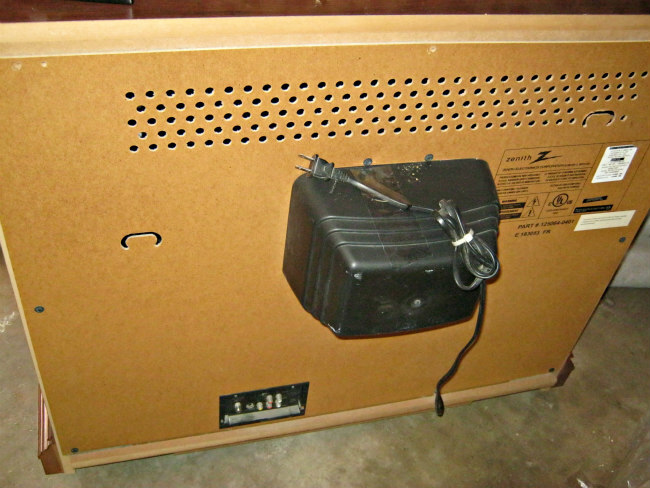 Anyway, one fine day the old Zenith finally pooped out and I was able to get a new 32 inch flat screen TV. 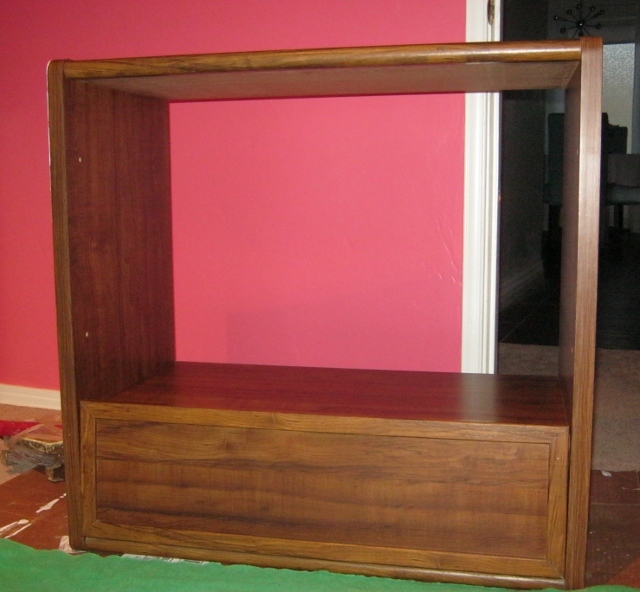 I was sure someone on Craigslist would love to take this precious relic off my hands for the bargain price of $10. A month later I officially gave up that dream and considered my options. While Option 1 was very tempting, I still needed a cabinet for my new TV and didn’t want to spend $100 to $200, so I chose Option 2. It turned out to be a good thing I didn’t attempt this project sooner because I discovered that you need to let the electricity drain out to avoid electrocution or, at the very least, a nasty shock. 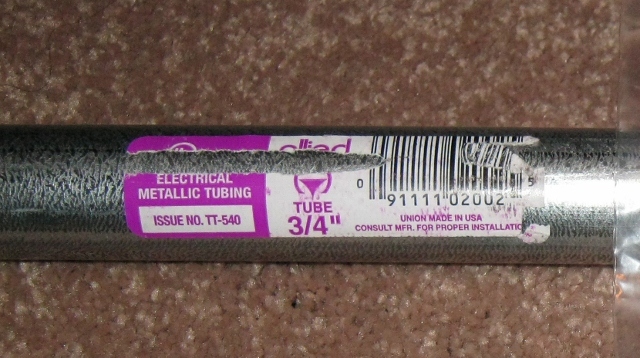 But if you’re in a hurry, here’s a short YouTube video showing how to safely discharge the tube. I’m not gonna lie. If I had known upfront what I was in for, I might have gone for Option 1. There were so many things that were screwed into things, that were screwed into other things that were bolted here, there and everywhere…it just seemed endless. But I decided this thing was not going to defeat me so I kept on. 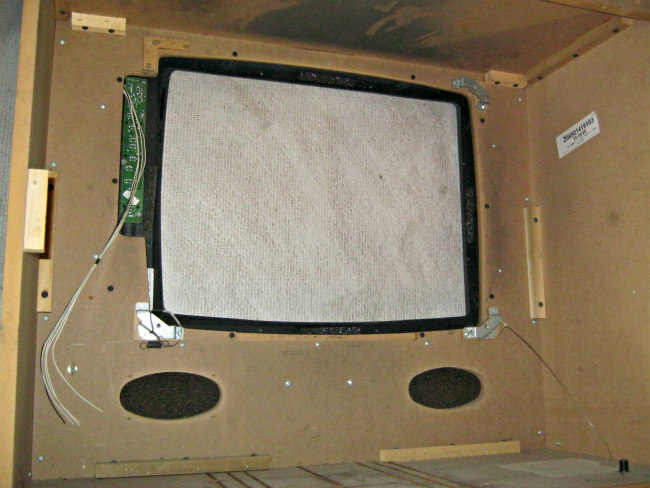 Inside the TV cabinet. So many wires! 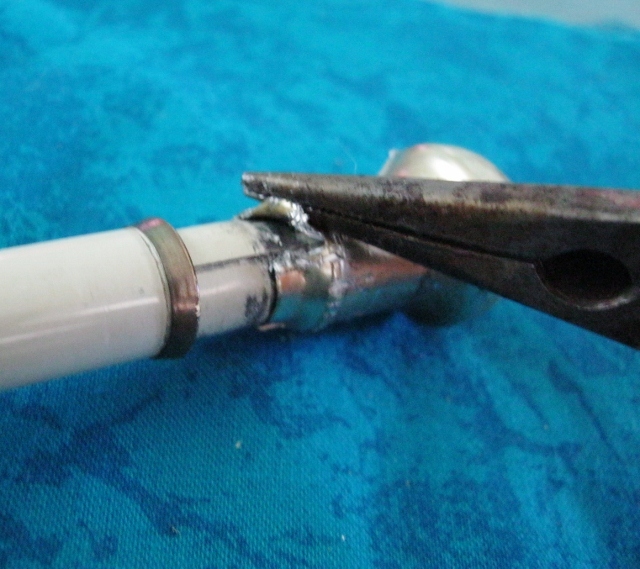 Then it came time to disconnect and remove the TV tube. I braced myself and pulled the plug. I did not get shocked. But I did get some weird red stuff on me. I don’t want to know what it was. Then I took it down to Best Buy for recycling. 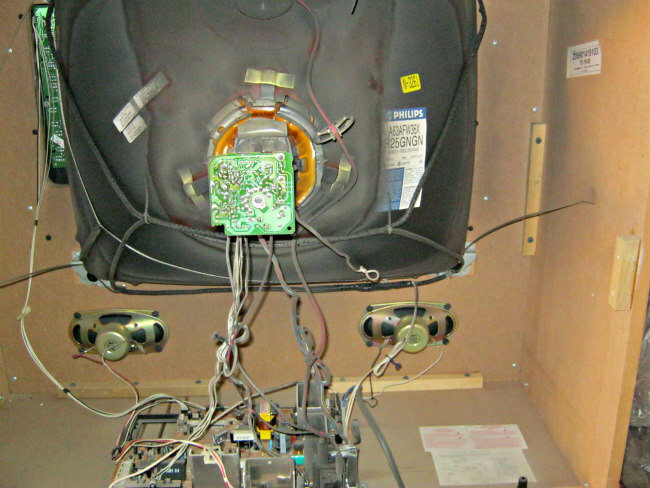 That was an adventure in itself because a 25 pound roundish TV tube is not easy to maneuver. I put it in a box and made it safely down there. 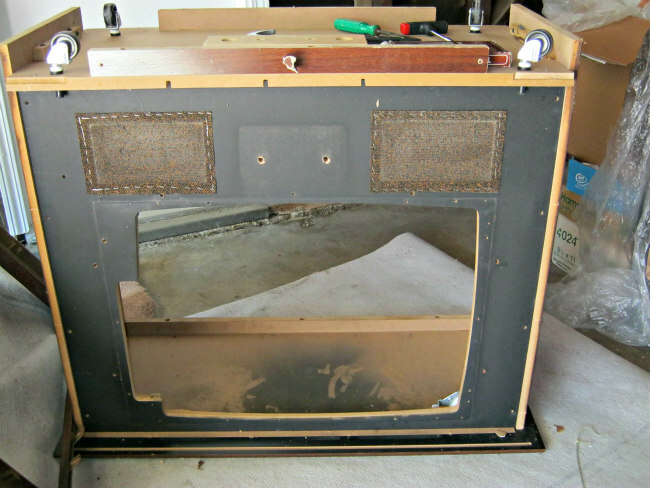 When I was done removing all the innards and taking off the fake plastic molding from the front, it was just a plain old wooden box. 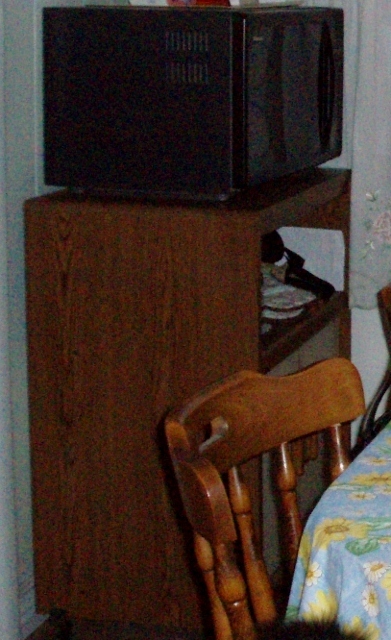 My plan was to put in a shelf to hold the new TV with enough room underneath to place my satellite receiver, DVD player and CDs/DVDs. And I wanted to add chrome legs to the bottom to make it taller and metal trim on the front to make it go with my retro modern coffee table. 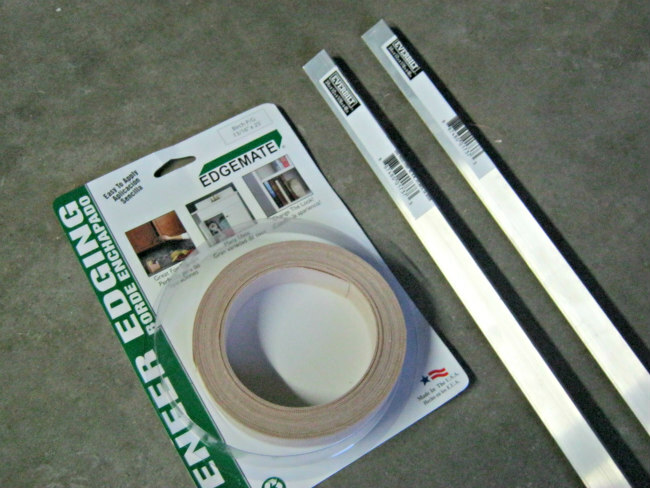 Being a resourceful DIYer and not a carpenter, I made do with the few tools I have. 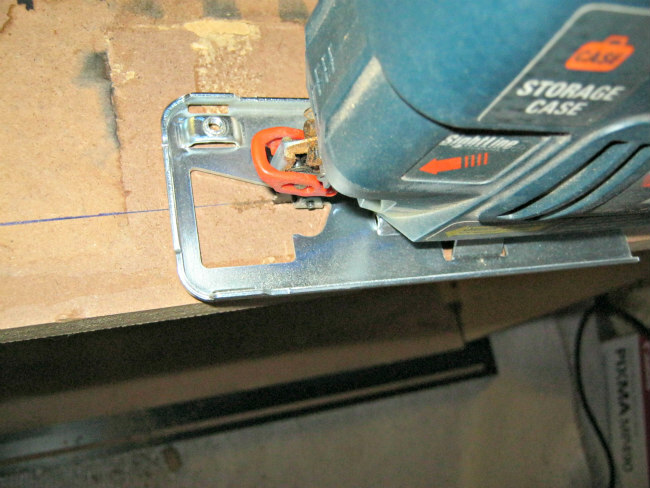 I used my jigsaw to cut the metal trim and wood for the shelves. 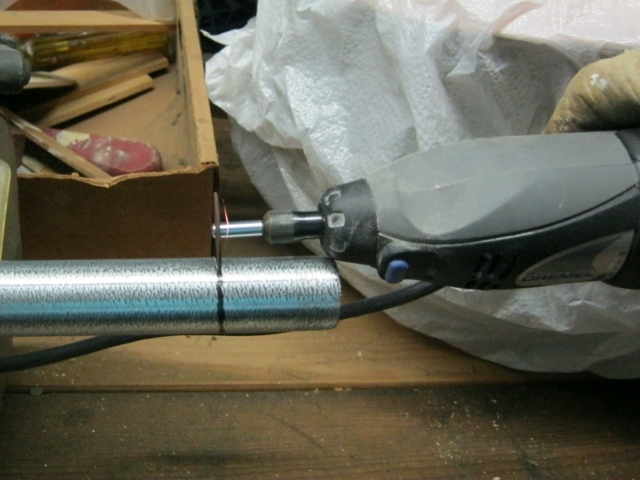 And then smoothed the rough edges with my mouse sander. I put wood veneer edging on the outside edge of the shelf and at the bottom of the cabinet where I had added a piece of wood for reinforcement. 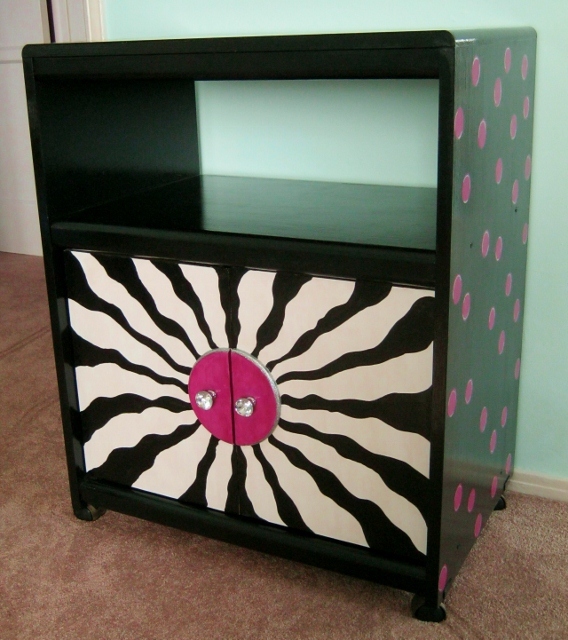 I spray painted the shelves, back and inside cabinet black with Rustoleum gloss protective enamel. On the bottom front of the cabinet I did some faux finishing. I mixed up some acrylic paint (black, brown, red and wine) to match the dark wood stain and painted the three wood veneer strips. For the spaces in between I used metallic silver acrylic paint. Then I coated everything with satin varnish. 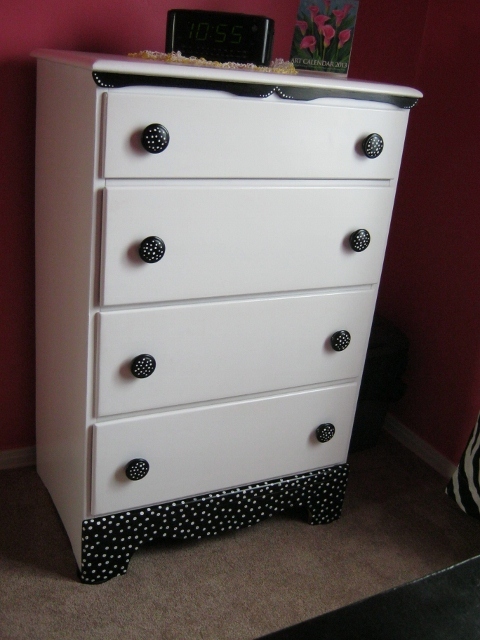 I added the legs, glued on the metal trim and voila! My new cabinet was done! 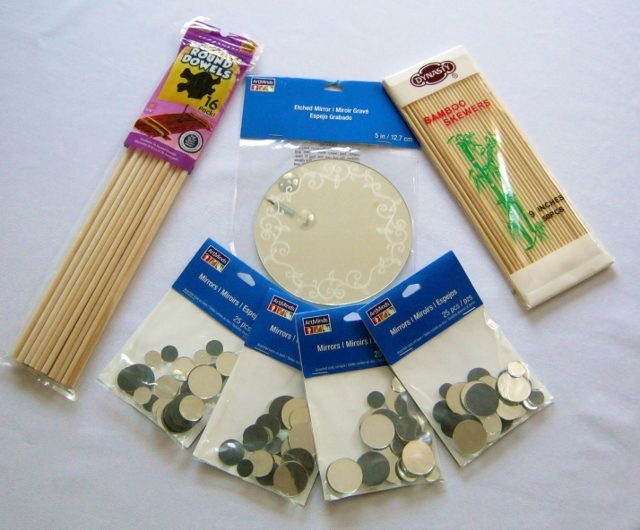 And it only cost me about $30 in supplies. And here is the final result. 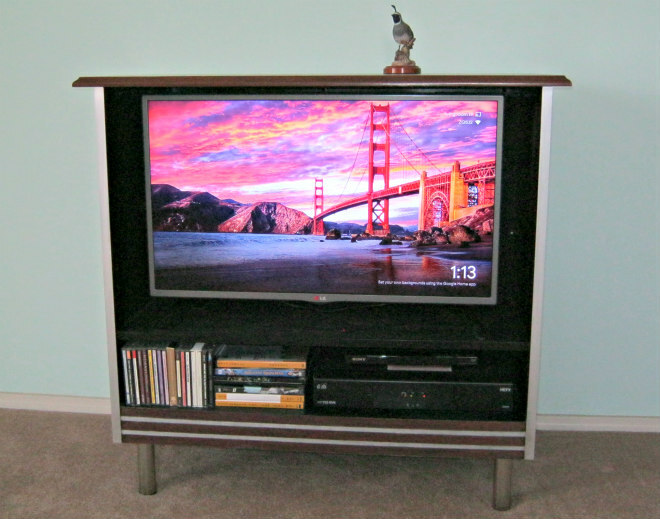 I love my TV cabinet! A few years ago we converted a closet into a much-needed second bathroom. 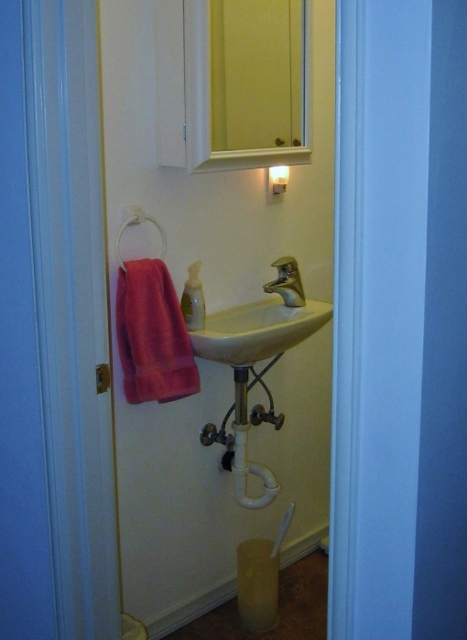 Actually, it’s just a half bath with a toilet and the tiniest sink you’ve ever seen. We managed to make pretty good use of what little space there is, about 41″ by 64″. But it was basically a boring white box, until now. In just two days I added fun and more function to this small bathroom. I love the result! And if you’re looking for an easy, inexpensive bathroom makeover, try following my five simple rules. 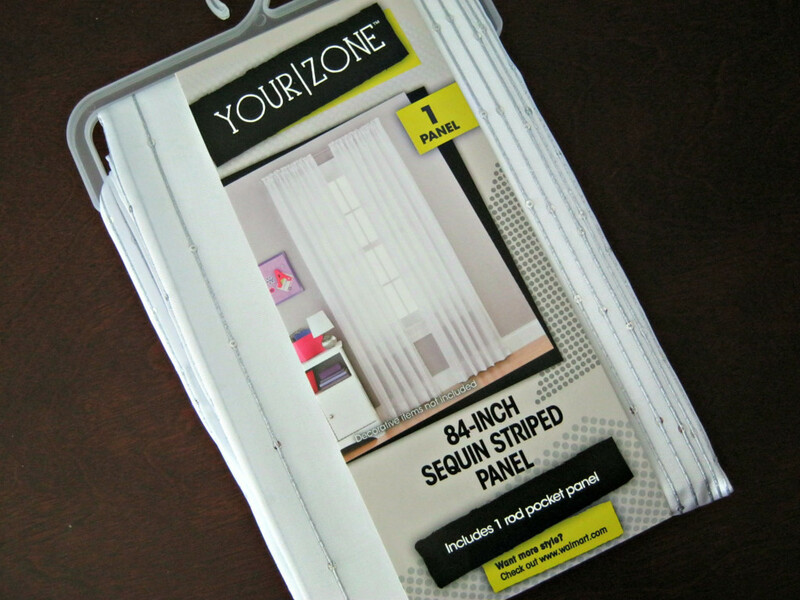 I’ll show you step by step how I applied these rules to my own bathroom makeover. 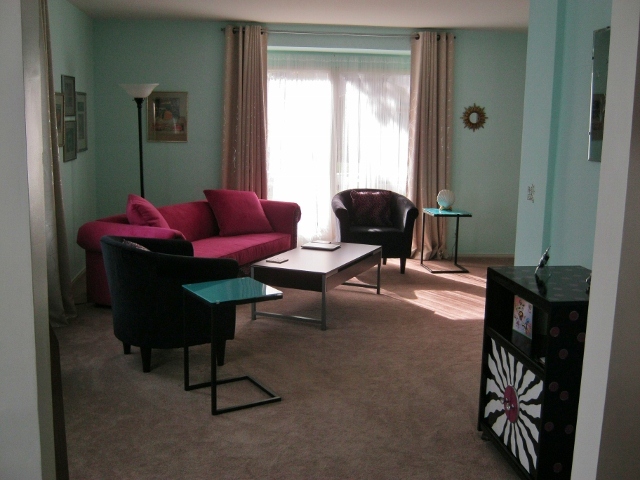 Put a nice pretty color on the walls. 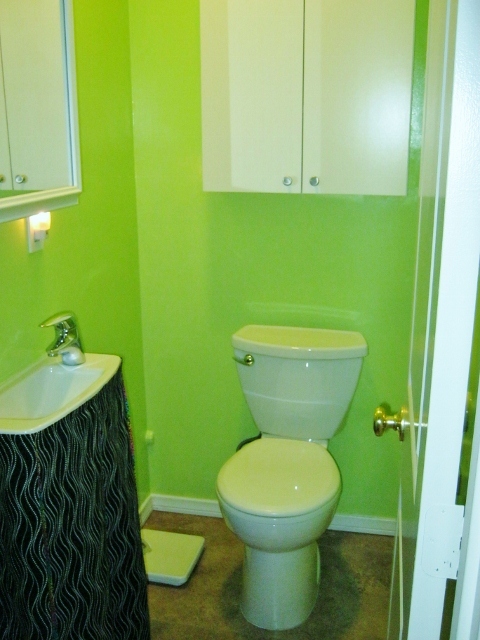 White paint won’t make your small bathroom look bigger, just bland. 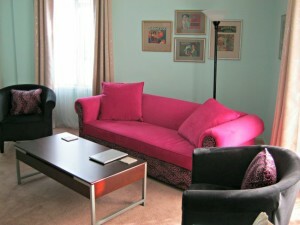 Color is dynamic and fun. It makes you feel something. My closet-turned-bathroom has no window and can look like a dark hole when the ceiling light is turned off. 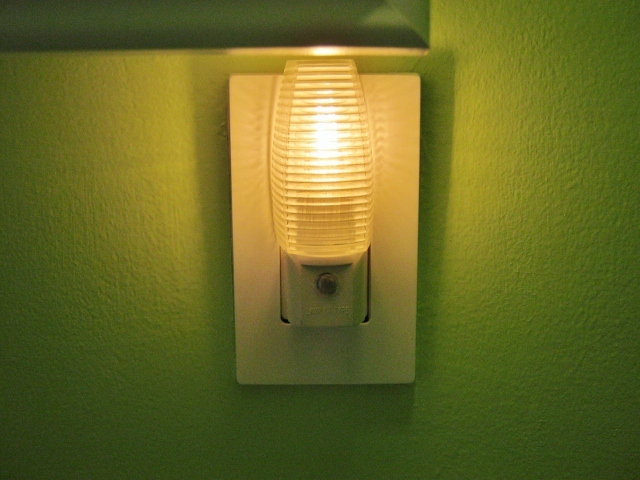 A small night light provides just enough light to make the space look inviting any time of the day or night. 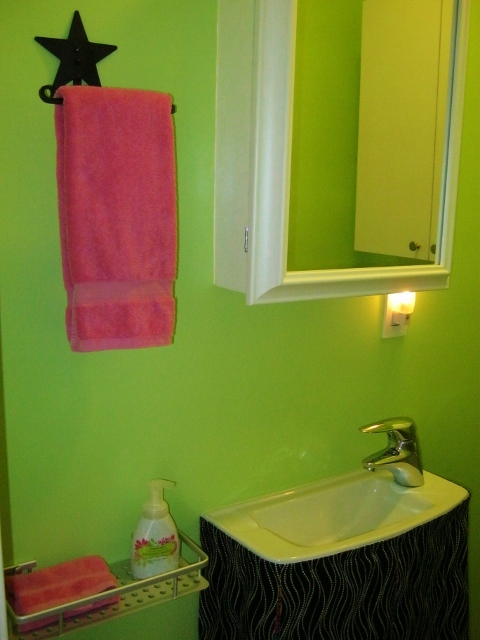 My other bathroom, which is also small, has a window but I put a night light in there too. These are lights that come on automatically and just make the rooms look pretty. 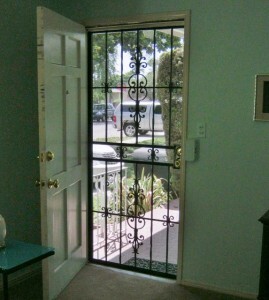 I tend to think less is best when it comes to accessorizing, especially in a small space. 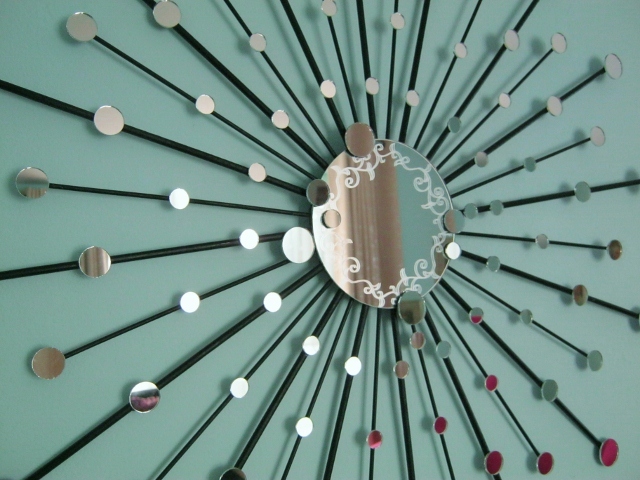 Choose accessories that are functional as well as decorative. Do you really need candles, toilet cozies and chachkies? 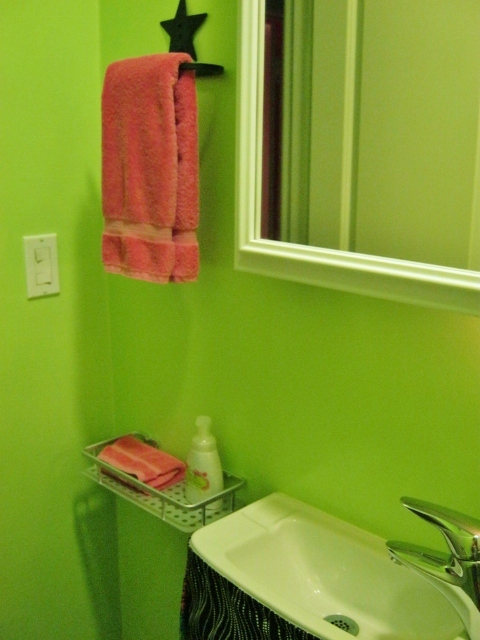 More useful options include colorful towels, a stylish towel bar, a cute soap dispenser or a small shelf. This bathroom didn’t have too many accessories, but what was here added nothing to the decor. 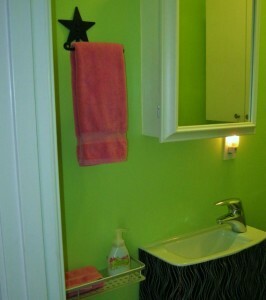 Even the bright pink towel was not enough to liven up the space. I switched out the nondescript towel ring for a handmade wrought iron towel bar with a decorative star. A little basket shelf was added next to the sink to compensate for the lack of counter space. 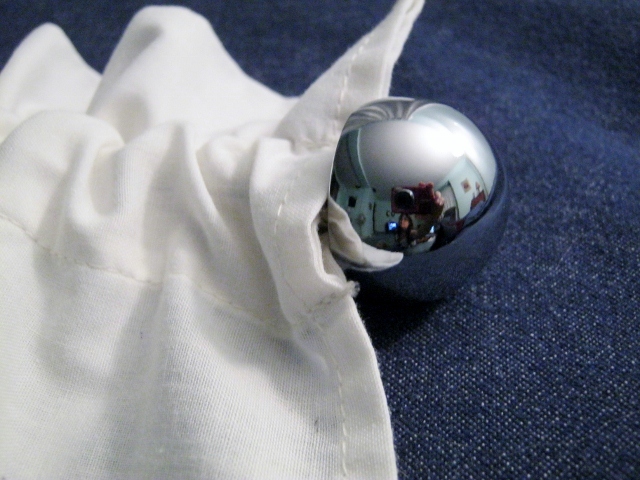 Overnight guests will find this handy when using their grooming accessories. Nobody wants to see your toothbrush, hairbrush or toilet brush. I don’t even want to look at my own stuff! Which leads into rule #5. This toilet brush needs to go away. 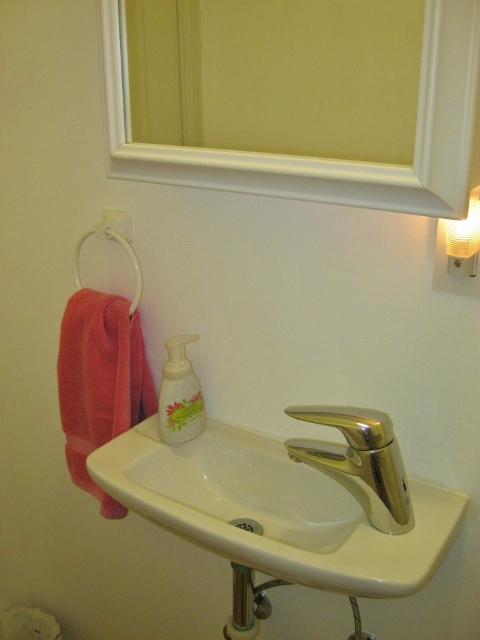 A mirrored medicine cabinet will hold a lot of toiletries. 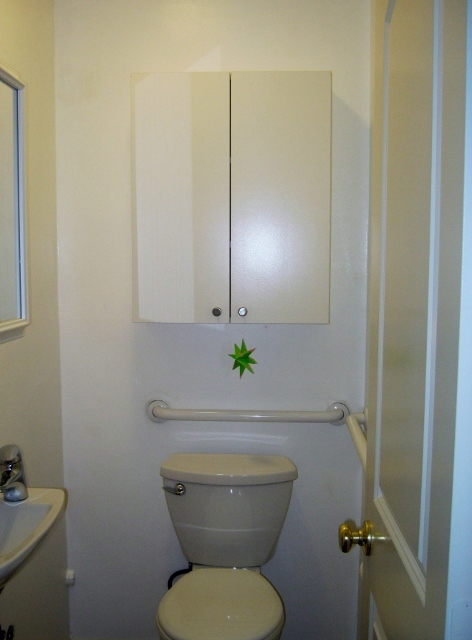 A wall cabinet over the toilet can store extra towels and toilet paper. 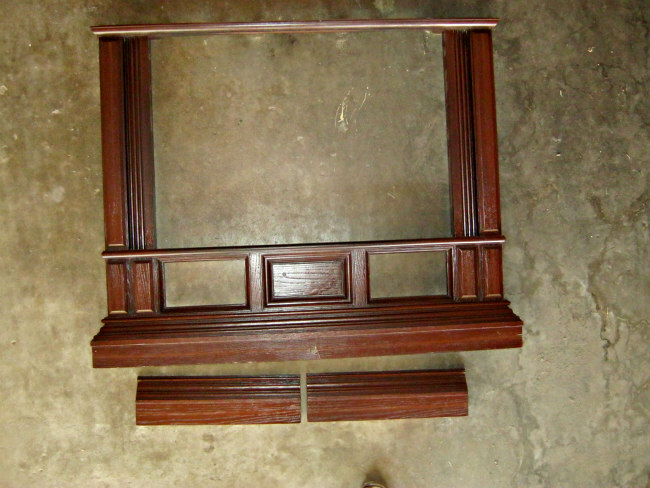 I like a cabinet with doors for a cleaner look. And don’t forget to utilize the space under the sink. 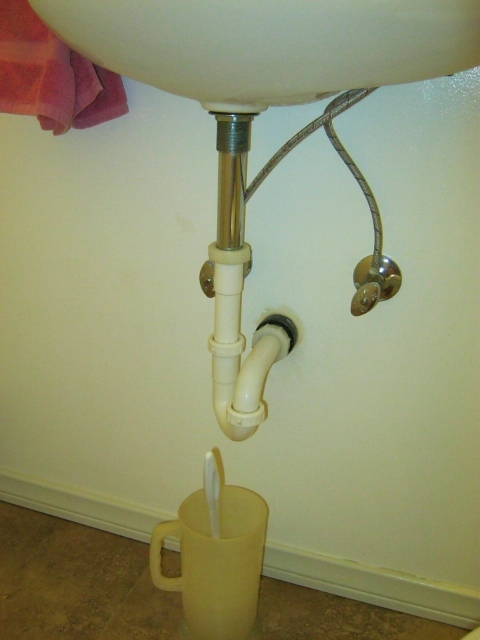 For a wall-mounted sink with no cabinet, you can make a sink skirt which hides the plumbing and becomes the perfect place to store the toilet brush. 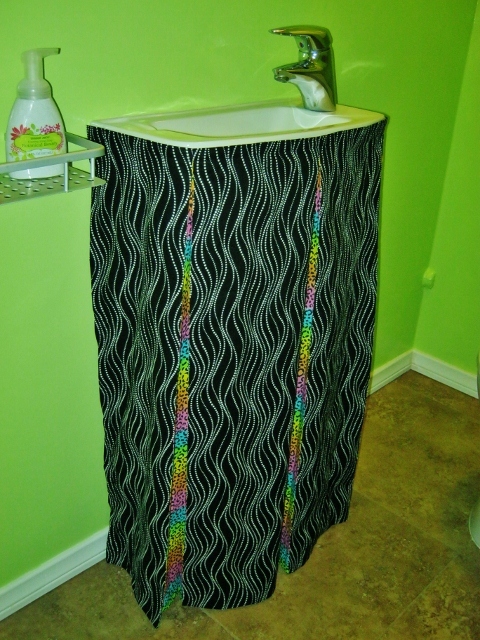 A cute pleated sink skirt creates additional storage for the toilet brush and a few other things. To fab, modern and fresh! A new coat of paint can do wonders to revamp your decor. 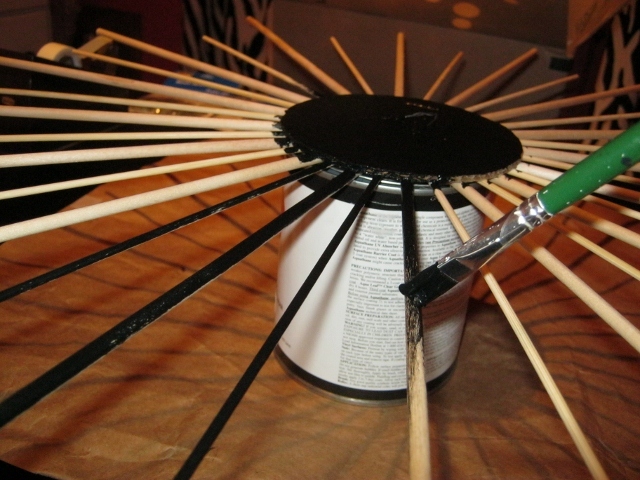 And you’ll be amazed to see how far one cheap can of Rustoleum spray paint can go. 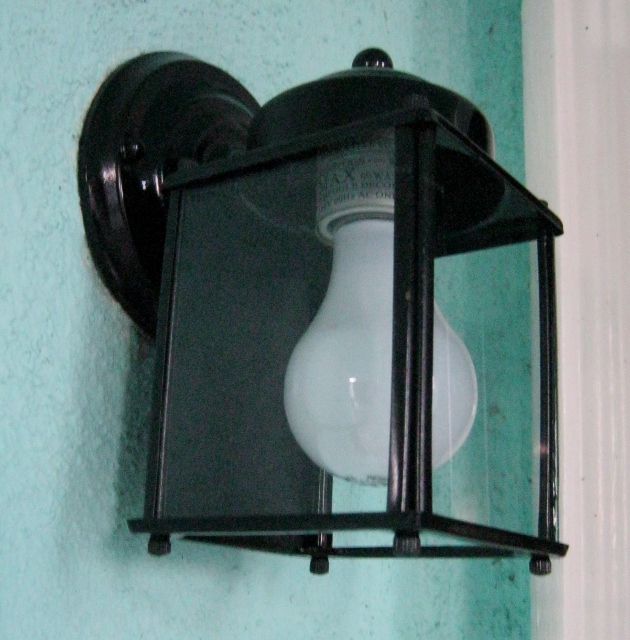 My old and tarnished porch light, floor lamp and dresser pulls were instantly transformed. Now they look like new and I saved a lot of money by not having to replace them. And that makes thrifty me very happy! At my local hardware store, Rustoleum spray primer and enamel each cost around $4 including tax. The coverage is really great and it comes in several different colors and finishes. I prefer enamel gloss but you can also get matte. 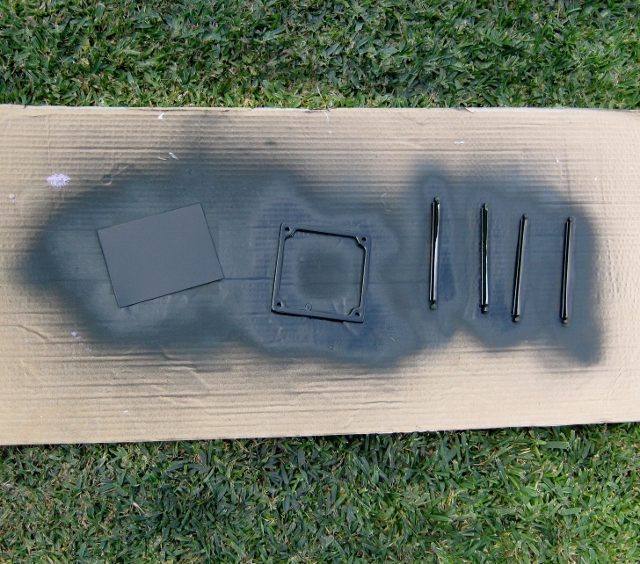 Spray painting is easy to do, keeping a couple of simple things in mind. 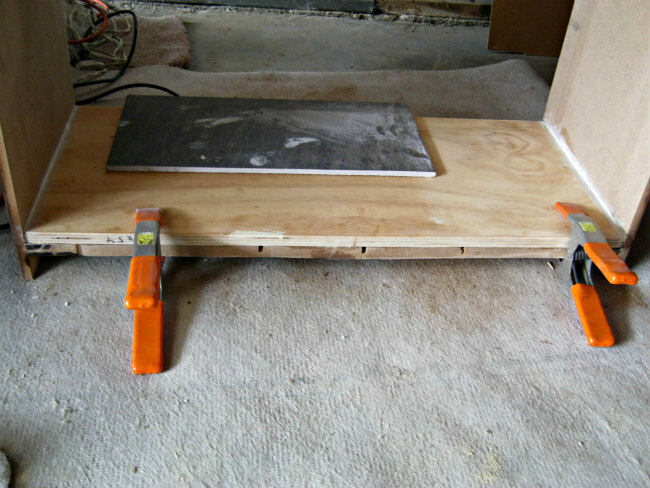 Following are the step by step photos and a breakdown of how much money I saved on each project, totaling over $200. 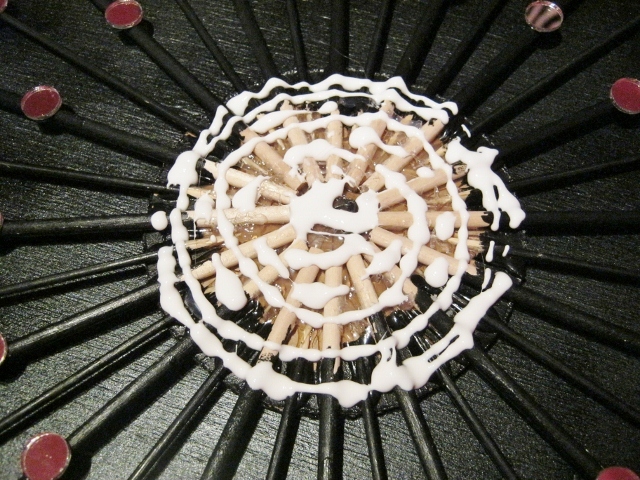 Begin spraying before the piece, sweep across it and finish beyond the piece. Try to go at an even speed. Use spray primer first. 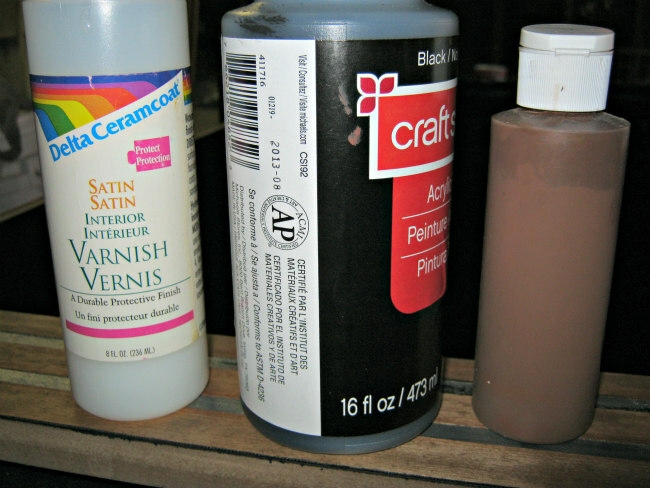 Do two coats, letting it dry for a few minutes in between. Follow up with two coats of the spray enamel. 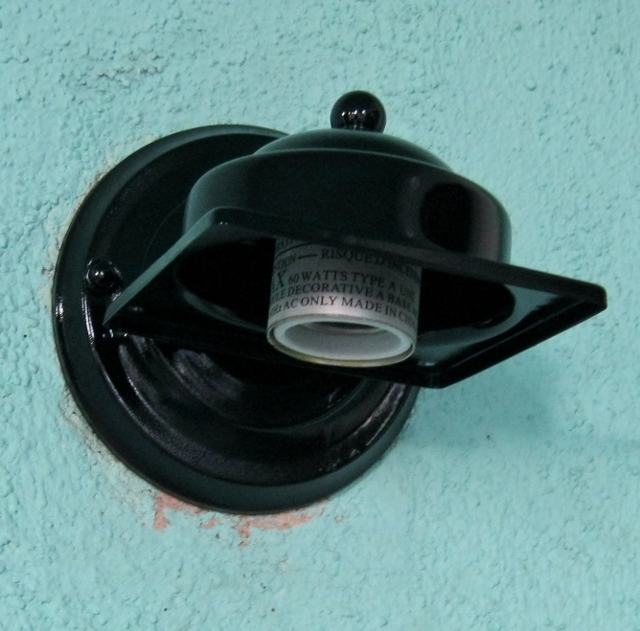 With the outside of the house being recently painted, the old black mailbox and tarnished porch light needed attention. After all, they’re right by the front door, and that’s the first thing visitors see. I was able to get the mailbox looking pretty good by just cleaning it and switching out the rusty handle. 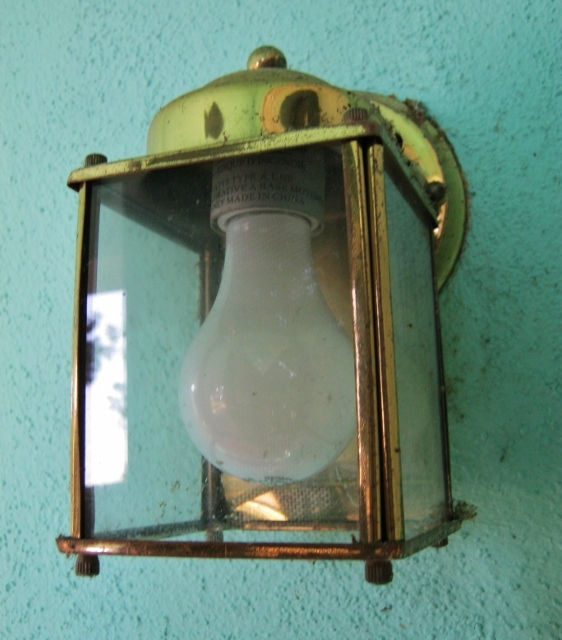 The 15 year old porch light, however, needed more than cleaning. 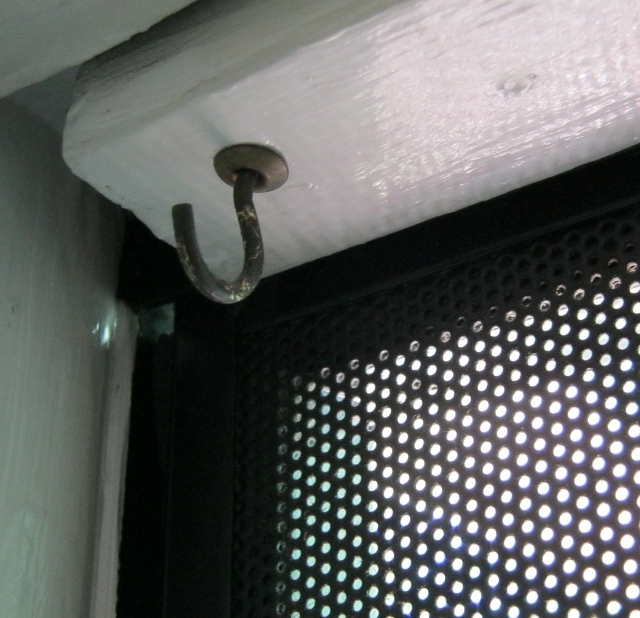 I unscrewed the bottom so I could remove the glass inserts and set them aside. 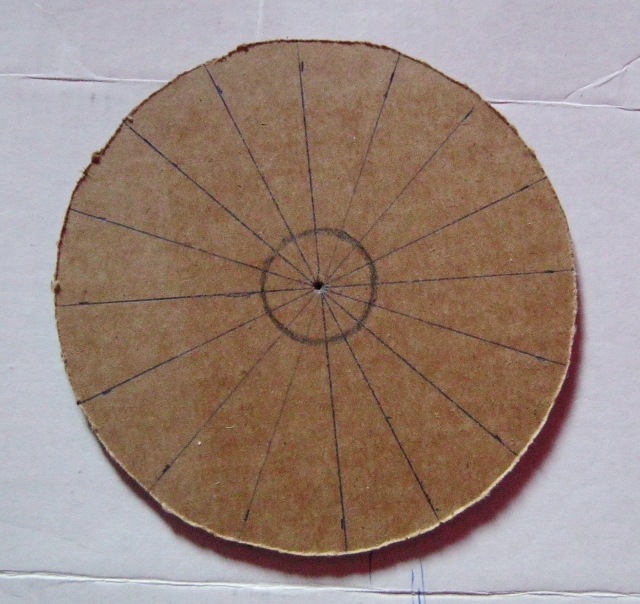 The other pieces were placed on cardboard for painting. 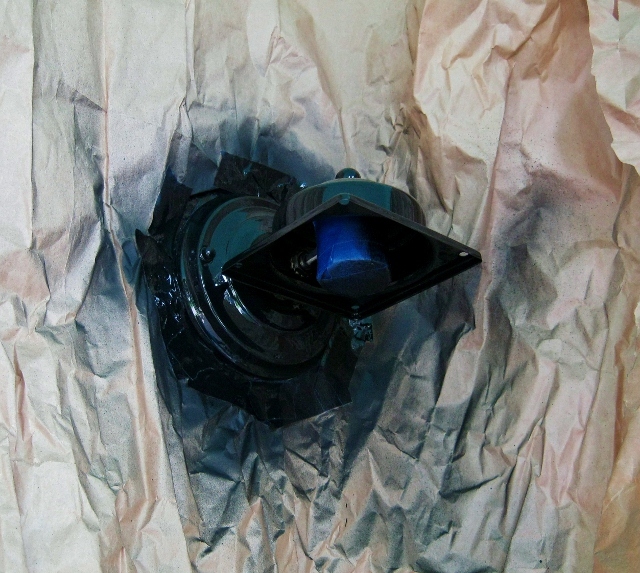 Using painter’s tape, I covered up the light socket. 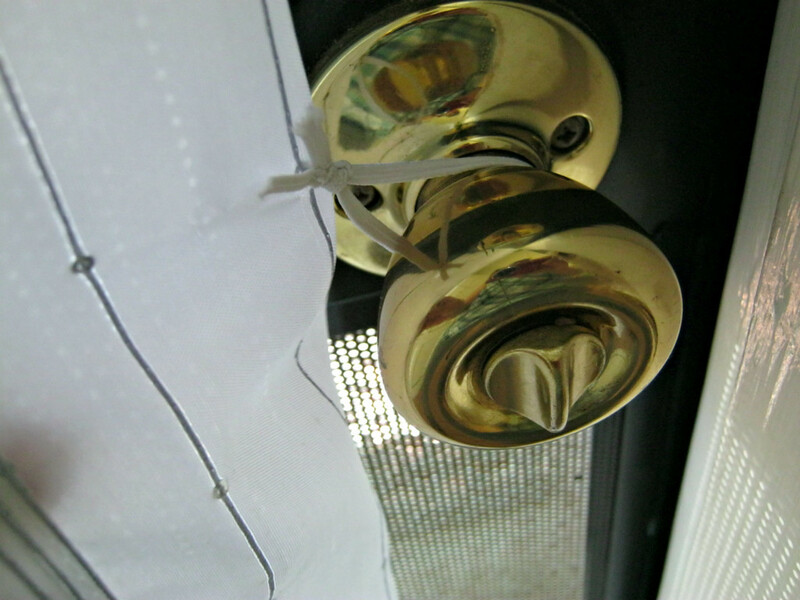 Then I took a large piece of brown packing paper and taped it around the fixture. 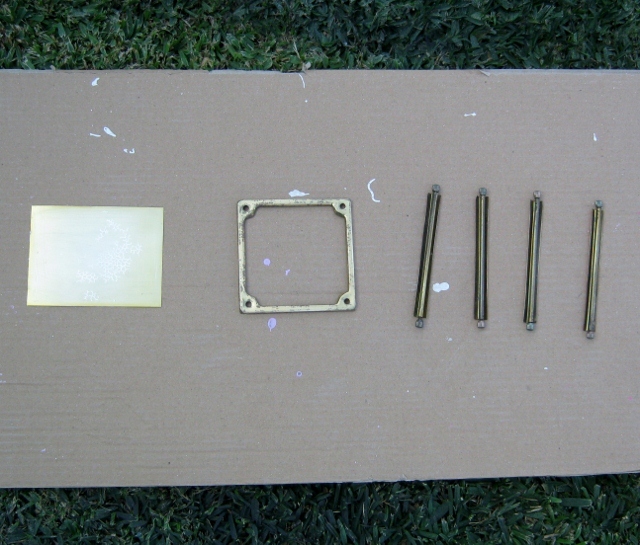 The light fixture and these loose pieces got two coats of primer. 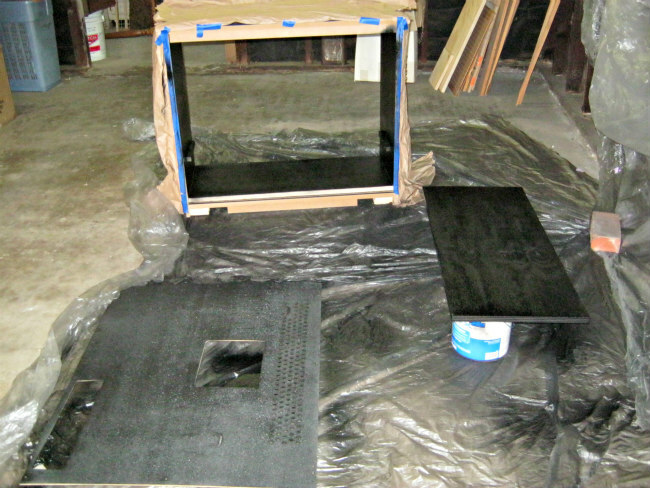 Everything was sprayed with two coats of black gloss enamel paint. Everything put back together. Looks like new! 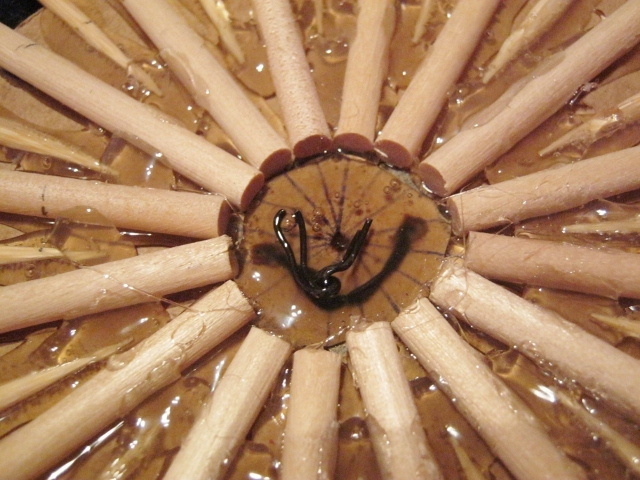 This torchiere lamp is about 20 years old. 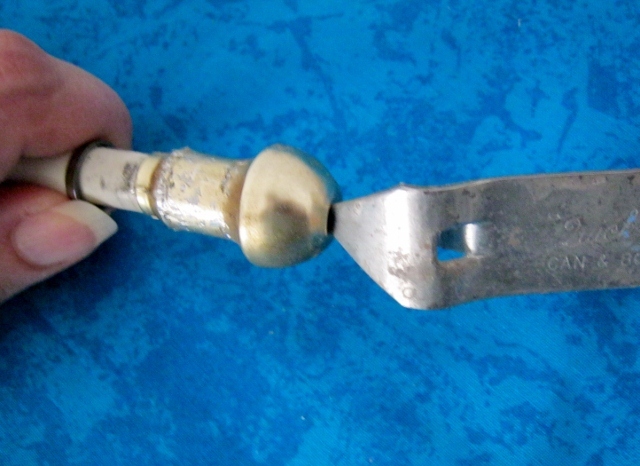 The gold finish is tarnished and wearing off. 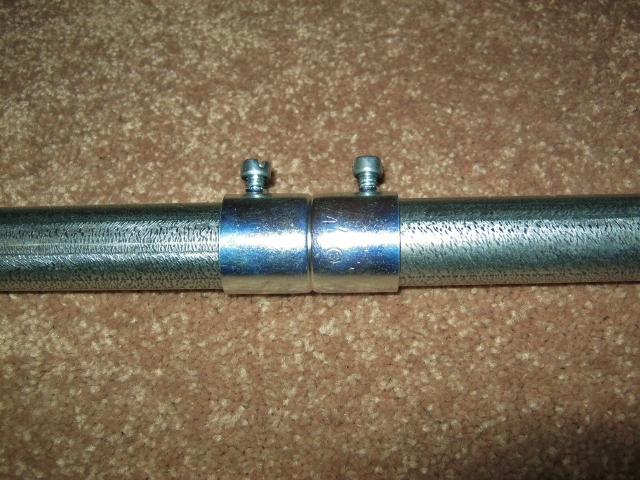 Here the shade was removed prior to being spray painted. 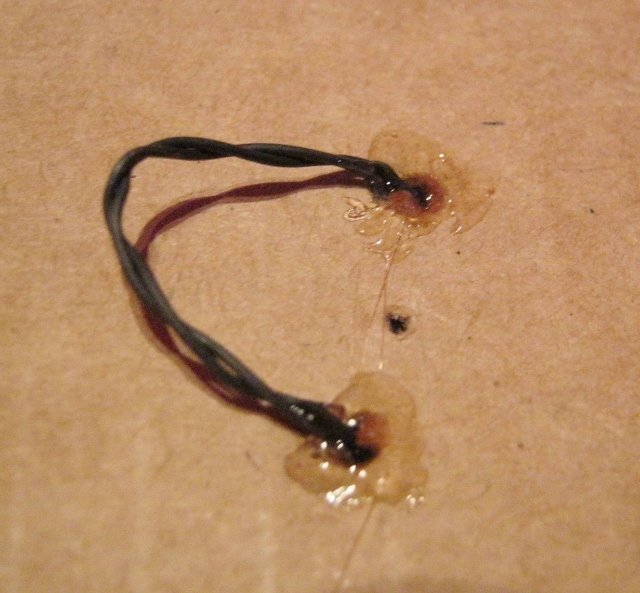 I also masked off part of the cord. Once again, two coats of primer and two coats of paint. All shiny and new. Maybe it will last another 20 years! 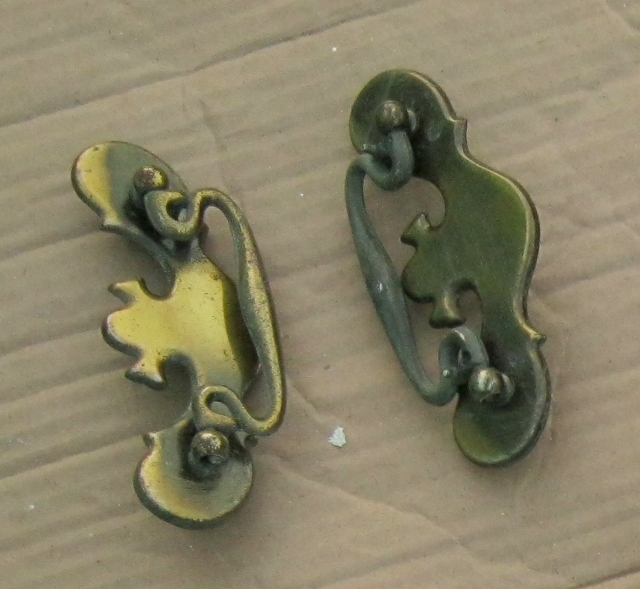 These brass dresser pulls are nearly 50 years old. They were really gunky and gross. 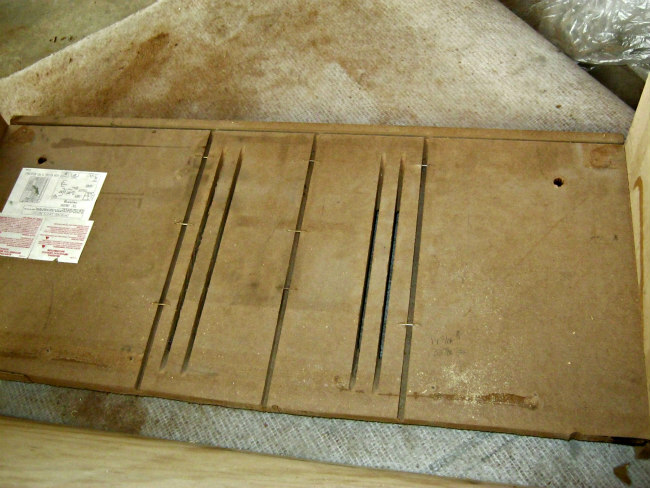 This is what they looked like after being cleaned. I wanted to give them a more modern look by painting them shiny black. 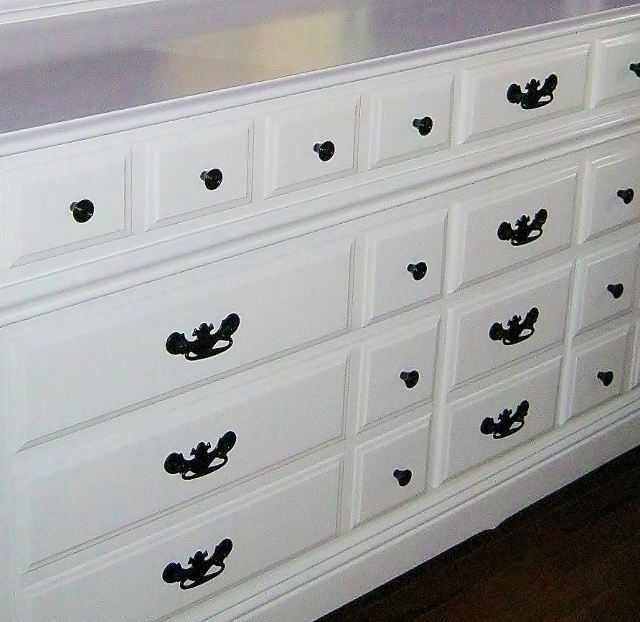 The dresser also had knobs. 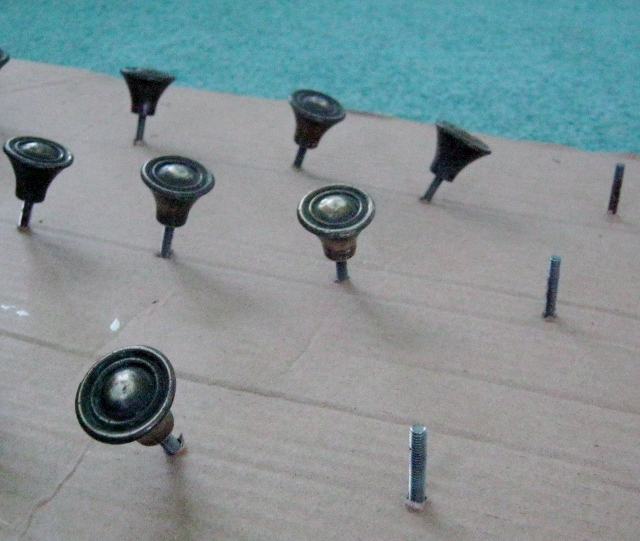 In this picture you can see that the knobs are screwed onto cardboard for painting. Once again, these received two coats of primer and paint. 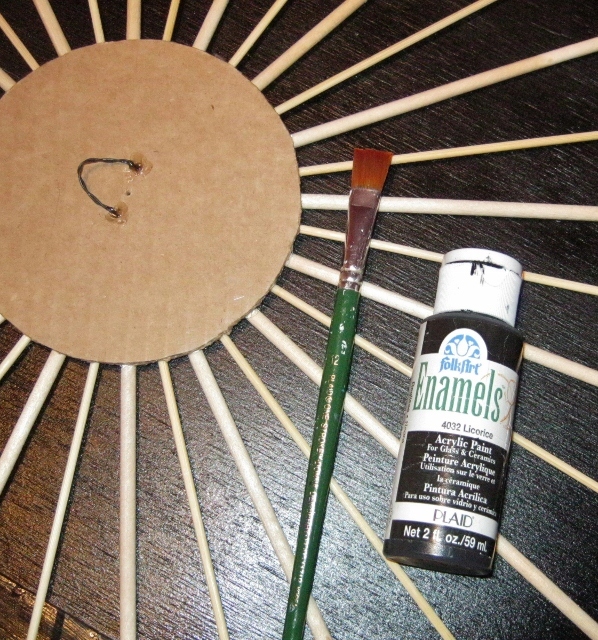 The directions on the can of spray gloss say that you can apply a sealer on top. 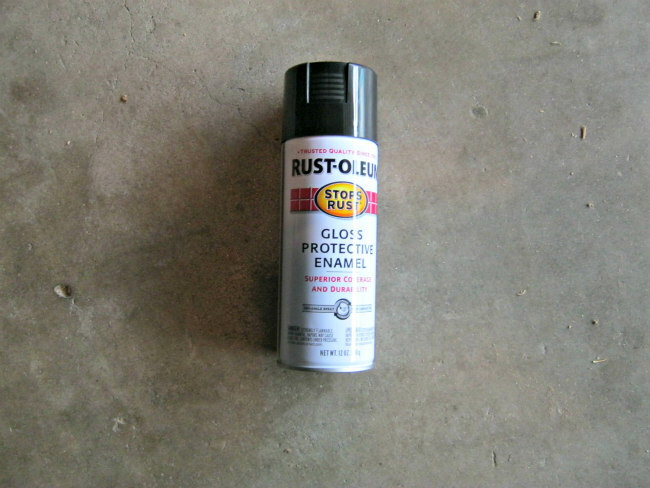 I called Rustoleum to find out if that was necessary. Since handles get a lot of “handling,” I didn’t want black paint rubbing off. They told me that was an optional step so I skipped it. After several months of use, I’m happy to report that there is definitely no paint transfer. I’m very pleased with the durability as well as the look. 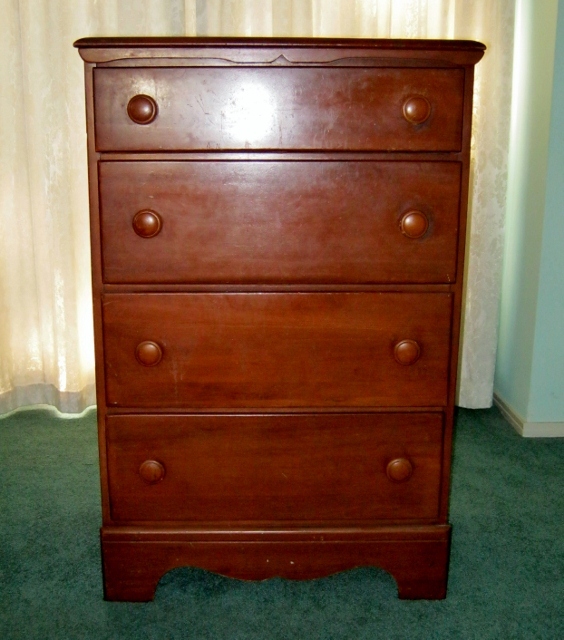 The dresser also had a matching chest of drawers. Altogether there were 21 pulls and 24 knobs. Now that’s a pretty good return on investment! 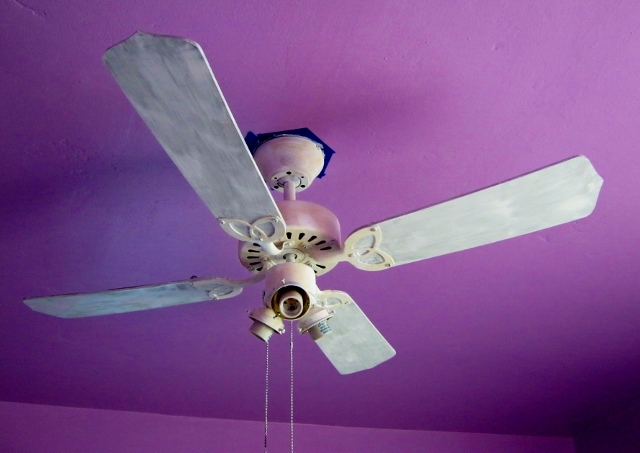 It’s true, you really can paint a ceiling fan without taking it down or even taking it apart. 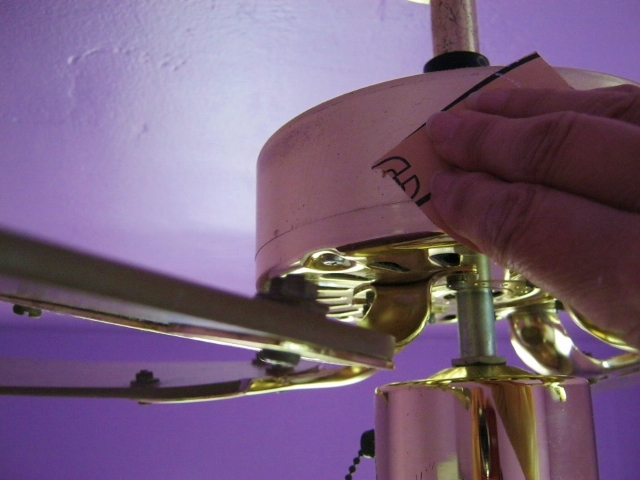 Most people will tell you that to paint a ceiling fan you must remove it or take the blades off. That’s simply not necessary. My way saves a lot of time and no one will ever know the difference. I painted this one with the blades intact. The only things I removed were the light bulbs and glass shades. 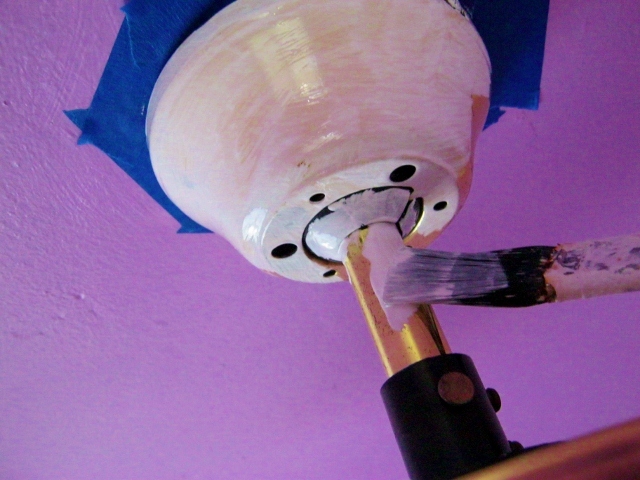 So follow along with the step by step instructions as I show you the fastest way to paint your old ceiling fan. 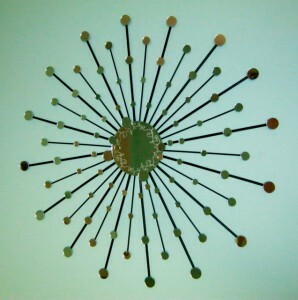 Here’s your typical fake wood grain ceiling fan. 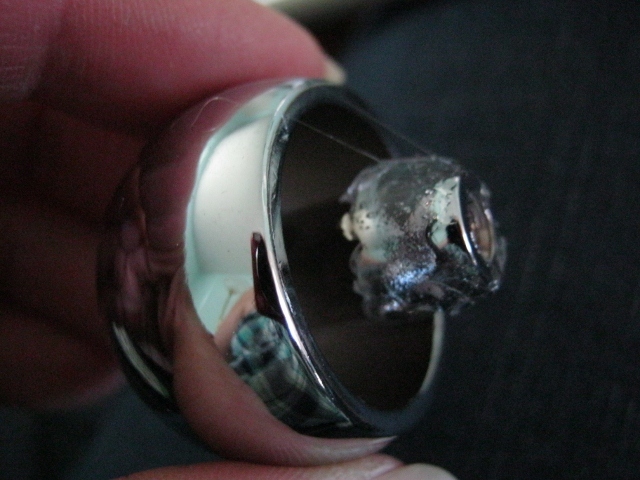 The gold finish is tarnished. I wish there was a paint that would make it invisible, but the next best thing is to make it part of the new decor. Everything in this room is about to change. This is messy and my least favorite part of the project. 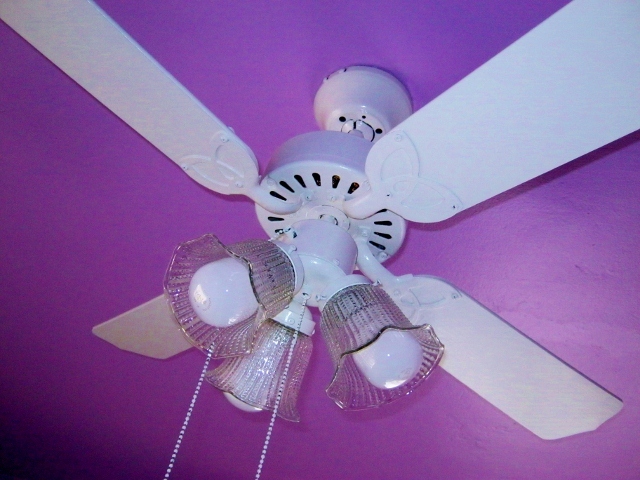 Even if you think your fan looks clean, believe me, there’s a lot of gunk hiding up there. 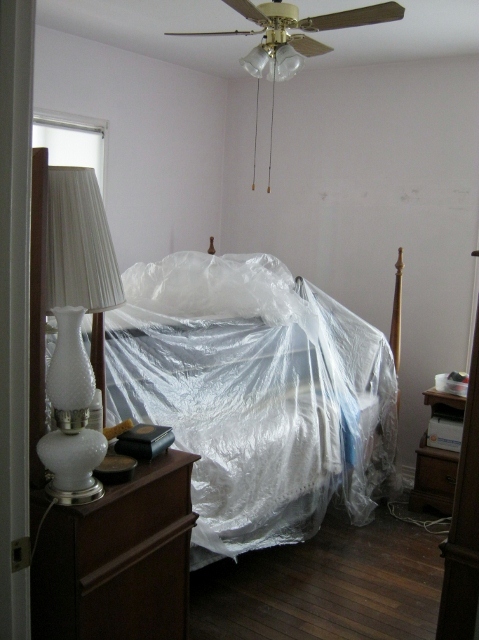 Cover the area underneath with a drop cloth. 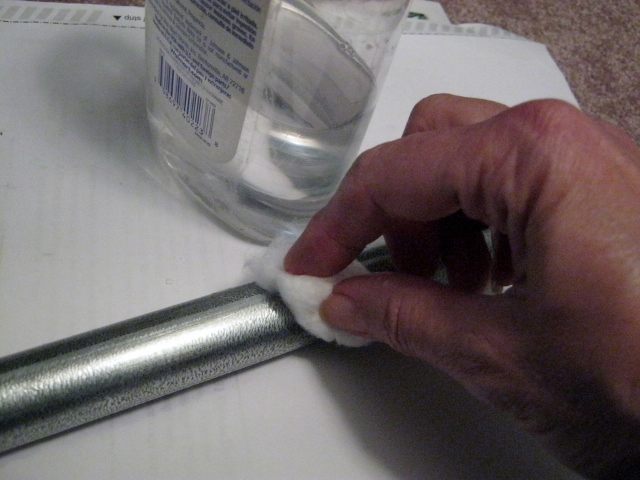 Then use your dry paintbrush to remove all the loose dirt. There will be a lot of stuff on top of the blades and inside the arms. 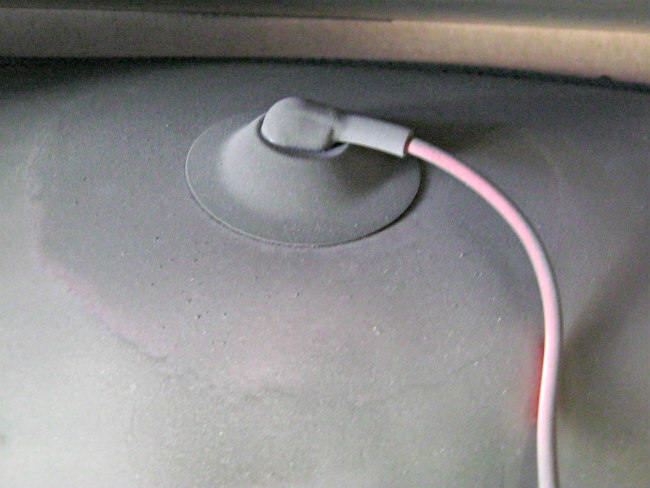 The round thing that covers the motor will be dusty as well. After that, clean the fan with paper towels and Windex. Make sure to clean the top and the bottom of the blades. 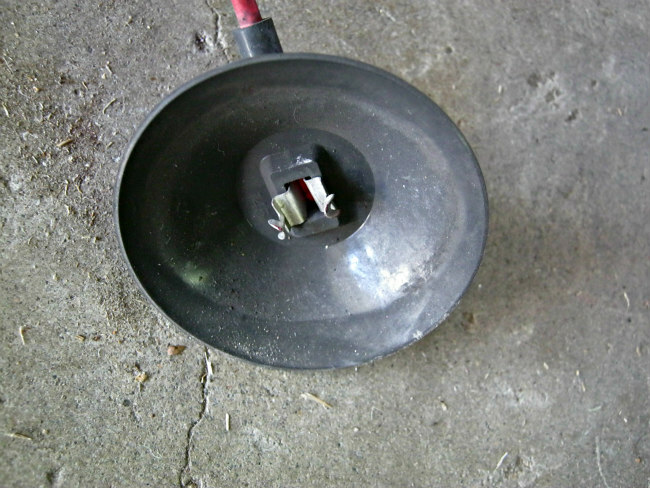 When it comes to cleaning the motor cover, don’t spray Windex directly on it. Spray the paper towel instead. Before tackling the fan, the bedroom was painted a yummy shade of purple called sugar plum. 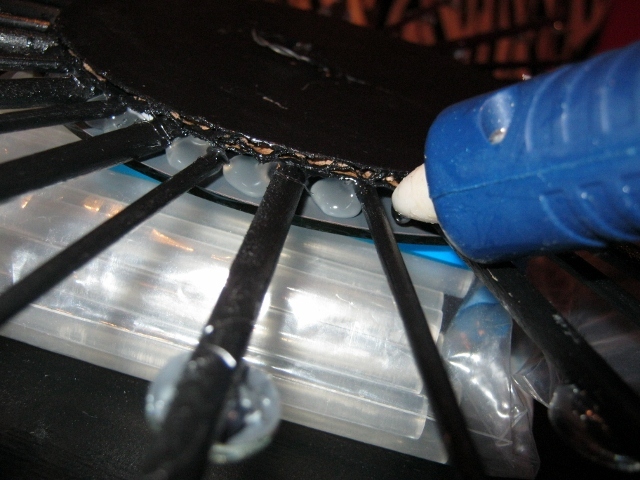 Sanding the fan makes it easier for the paint to stick. I only sanded the metal parts. 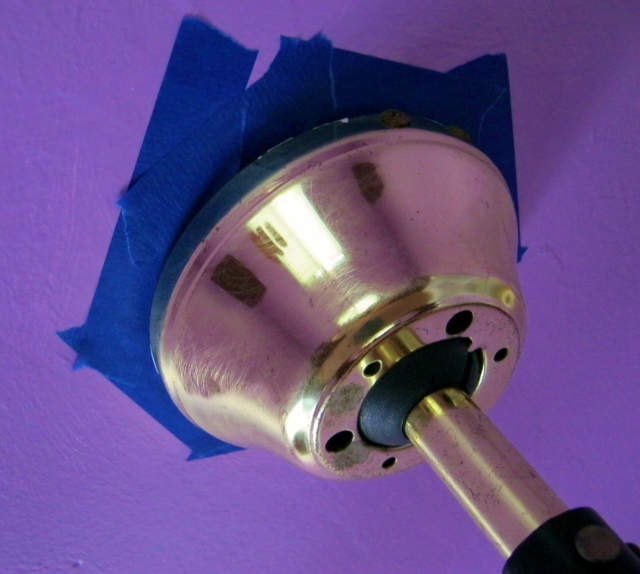 Adhere the painter’s tape to the ceiling. I managed to slip it underneath the fan. Paint a thin coat of primer. 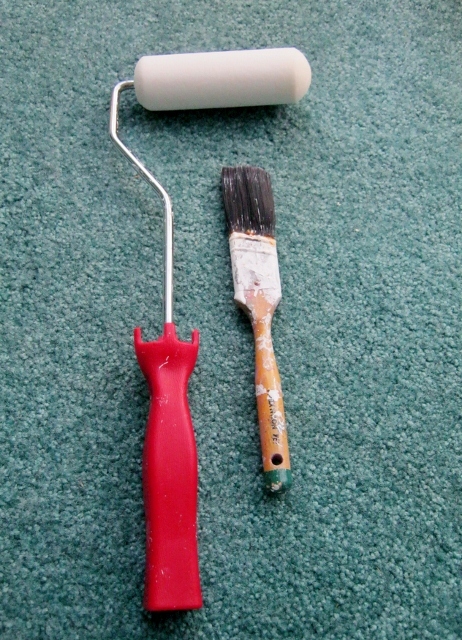 Notice how I only used a small amount of paint on the brush to avoid dripping. Make sure to keep the paint out of the motor. 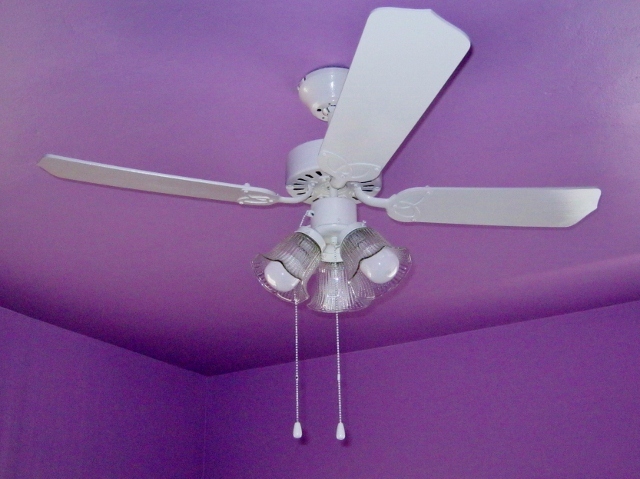 Painting ceiling fan blades: You only have to paint what people can see, so you do not have to paint the top of the blades. It can get a little tricky painting them because they move. You need to hold on to one that hasn’t been painted to keep them still. 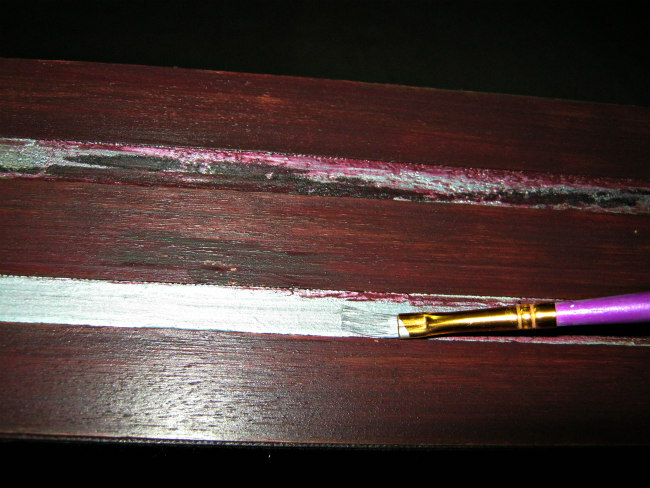 To paint the last blade, you can put one hand on top of it while you paint the underside with the other hand. Let paint dry for a couple of hours. I painted everything, including the chain. 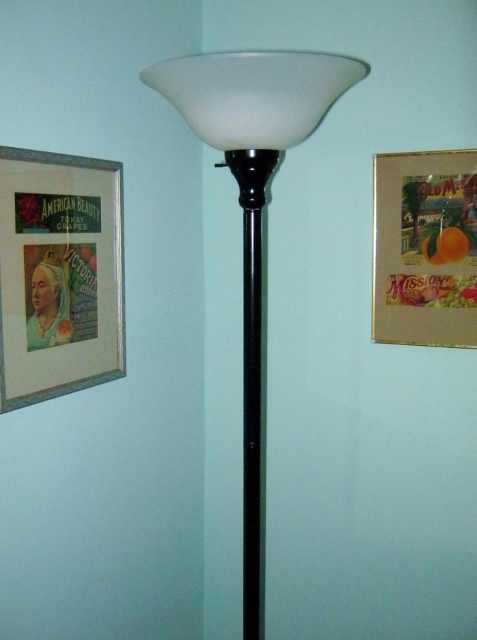 I painted two coats with a semigloss latex paint, allowing it to dry at least two hours in between. 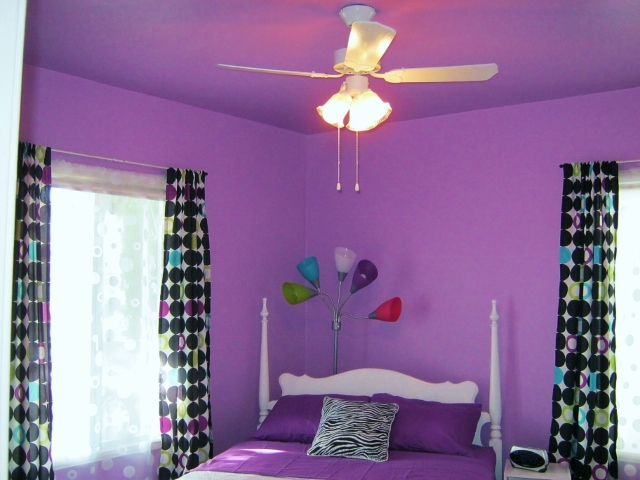 This was the same paint I used on the bedroom furniture. Here it is all finished and with the painter’s tape removed. It looks so much better painted all one color. As much as I love my neighbors, I really don’t love looking at their hot water heater. And I don’t particularly like the idea that someone might be peering in at me at any given time. 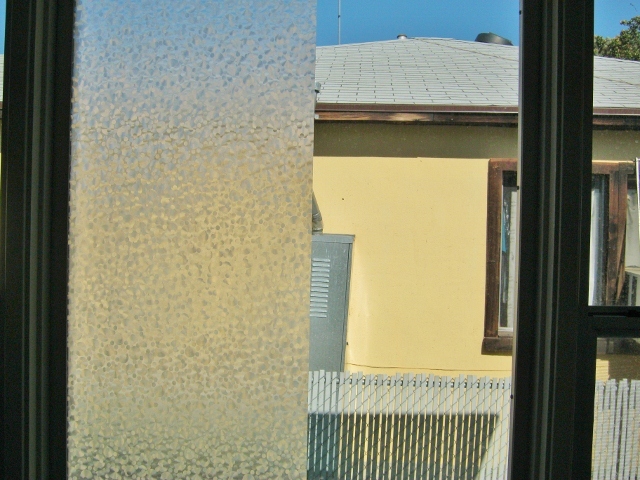 And then I discovered DIY window film, a simple and low cost solution for creating privacy and hiding an undesirable view. I mean, who wants to look at that when you’re trying to have a nice meal? 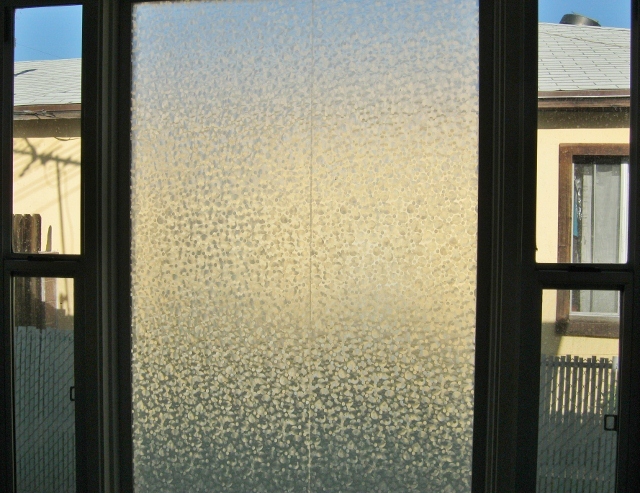 Short of building a super high fence around my property, privacy window glass film was just what I needed. 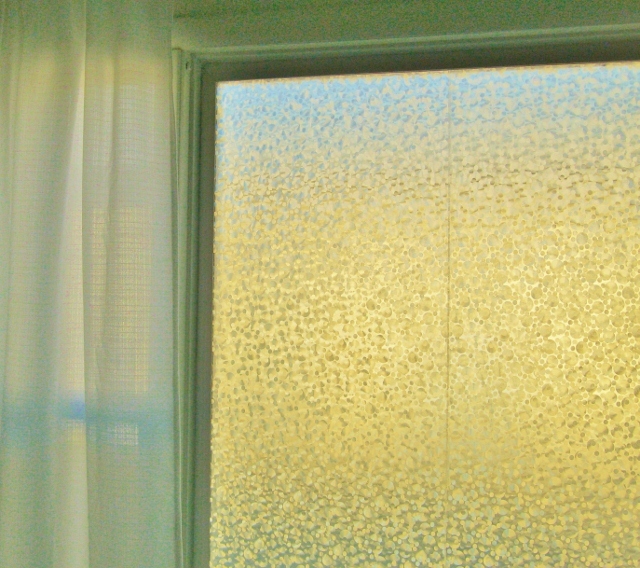 Better than curtains and blinds that can darken a room, frosted glass window film allows natural light in. 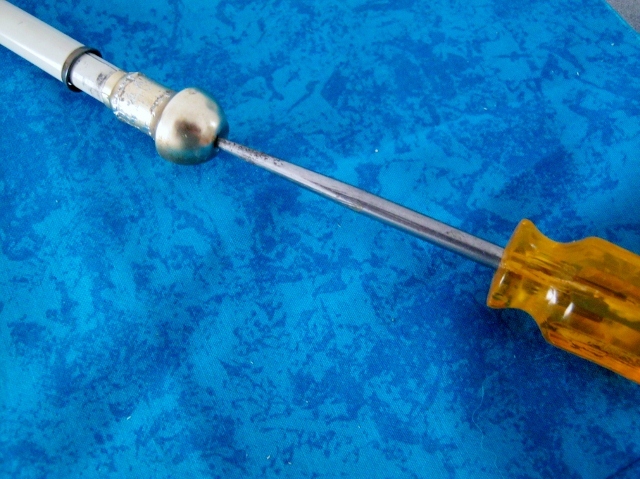 It’s easy to apply, reposition and remove without leaving a sticky residue behind. 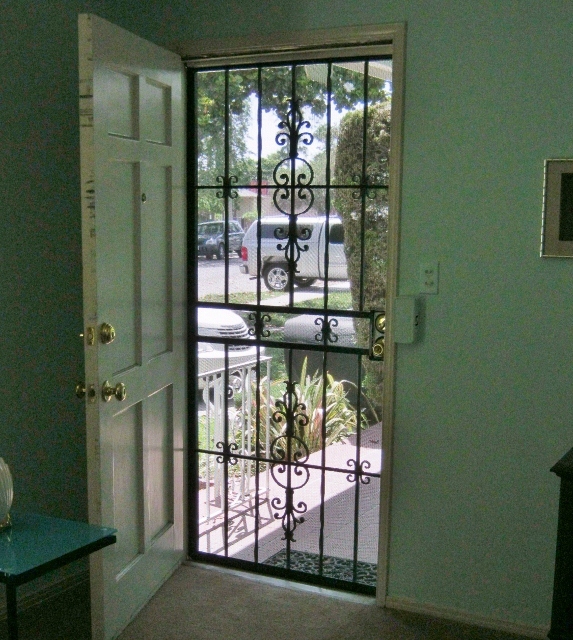 Decorative glass film is perfect for both homeowners and renters, whether their privacy needs are temporary or long term. Apply to clean glass. 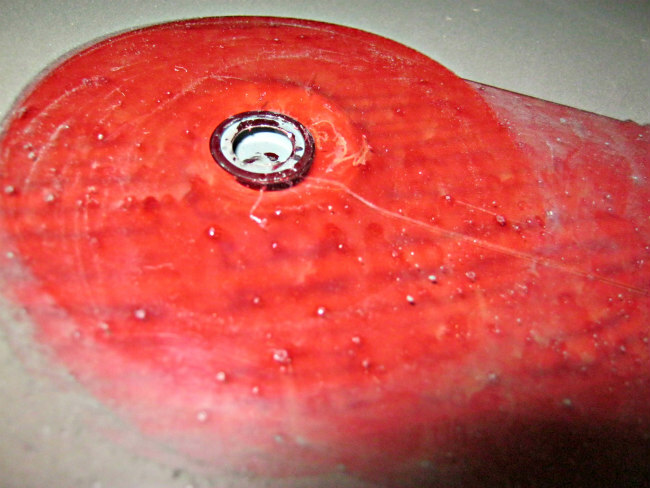 No adhesive or water required. 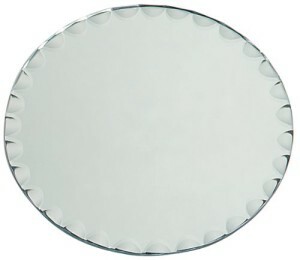 I fell in love with this circle design, from the many designs available, and bought some for my kitchen window. 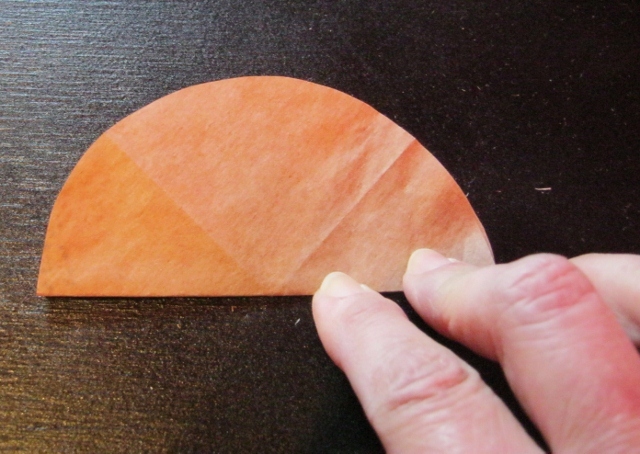 This is a heavy duty vinyl with a peel off paper backing. 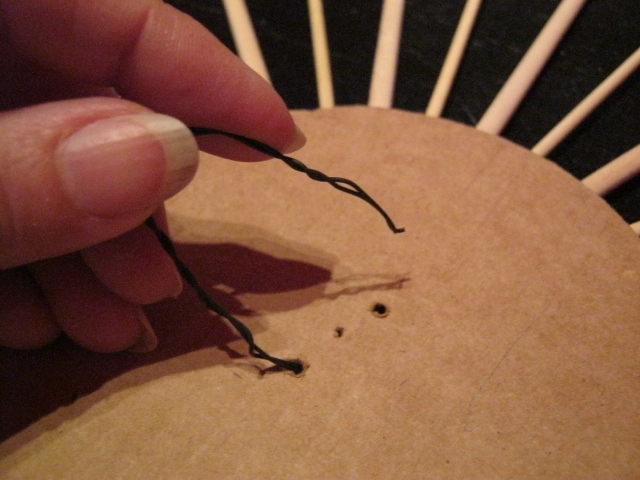 It’s really sticky yet leaves no residue on your fingers or the glass if you need to remove or reposition it. 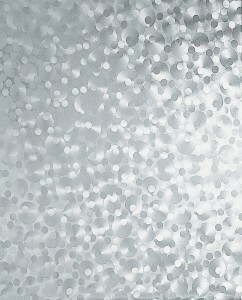 It can also be applied to walls for an interesting texture, like wallpaper without the commitment. 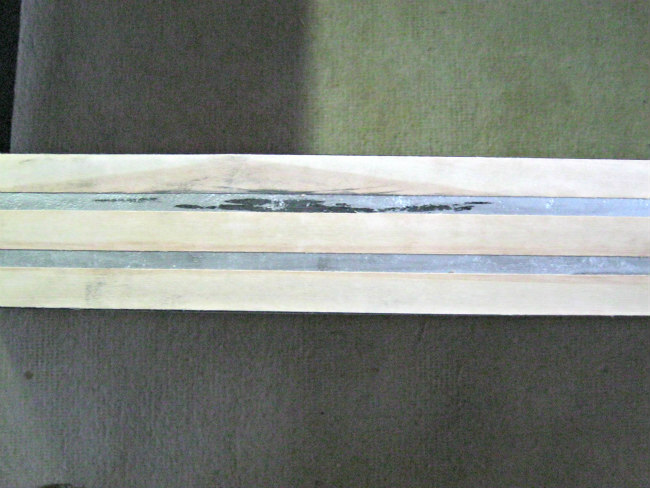 I only wish it came in a wider width (it measures about 17.5″W x 6.5’L). 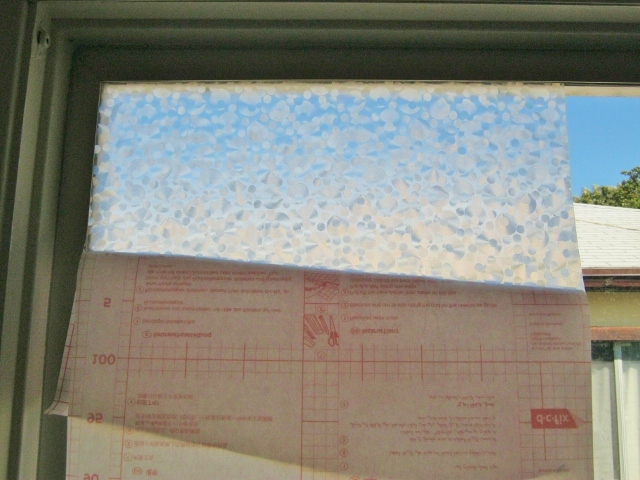 I had to use two pieces to cover my kitchen window. Overall I’m very happy with my choice, and you can see how it turned out below. 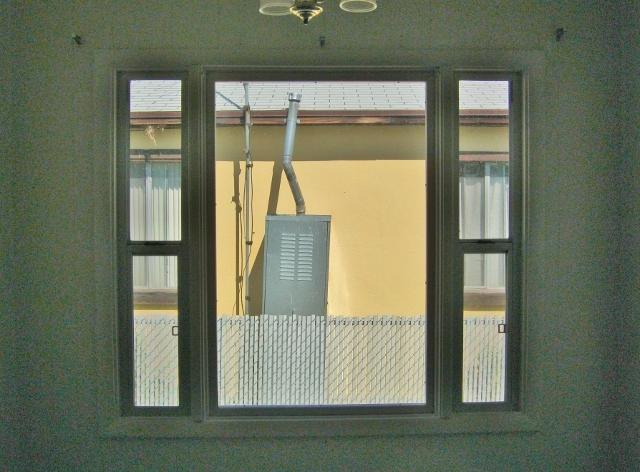 You don’t necessarily have to cover the entire window. Some people like to apply it just to the bottom half. 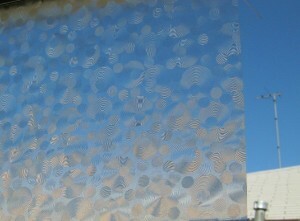 I’ve also seen designs made on windows using strips of film in various widths. 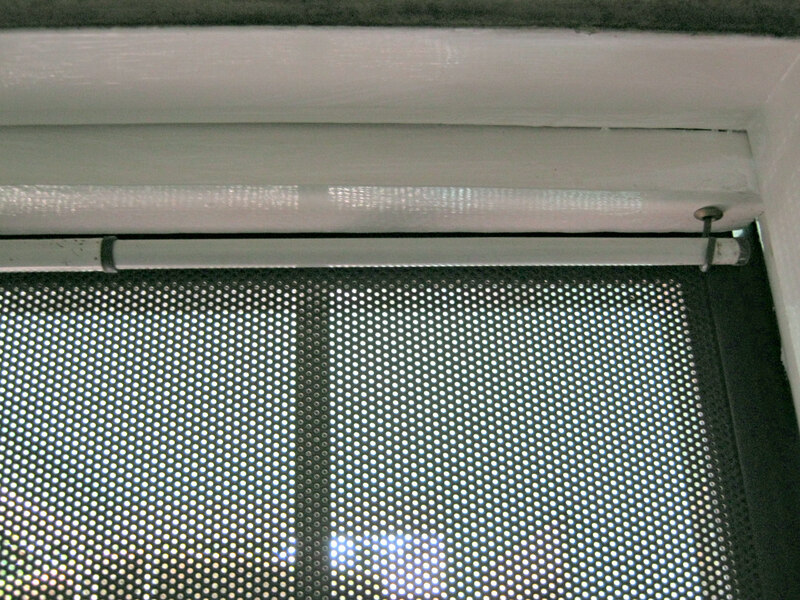 Cut off a length of window film a little longer than you need. 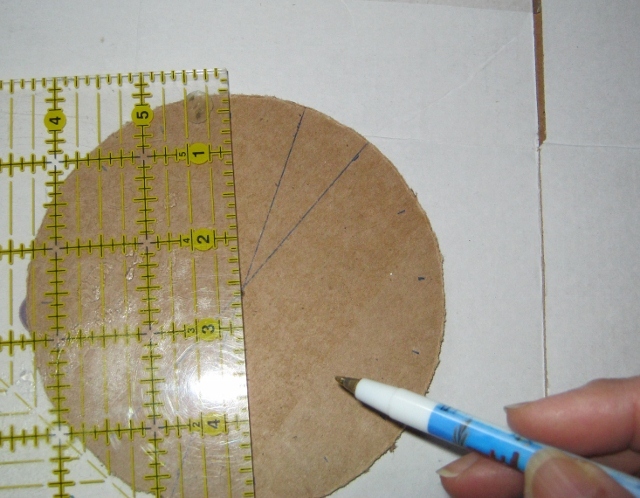 Grid lines on the paper backing make it easy to cut a straight line. 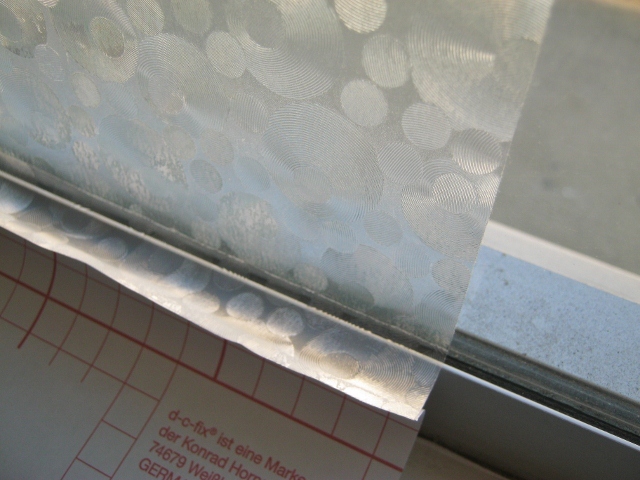 Peel down the paper a few inches and stick the film onto the window. 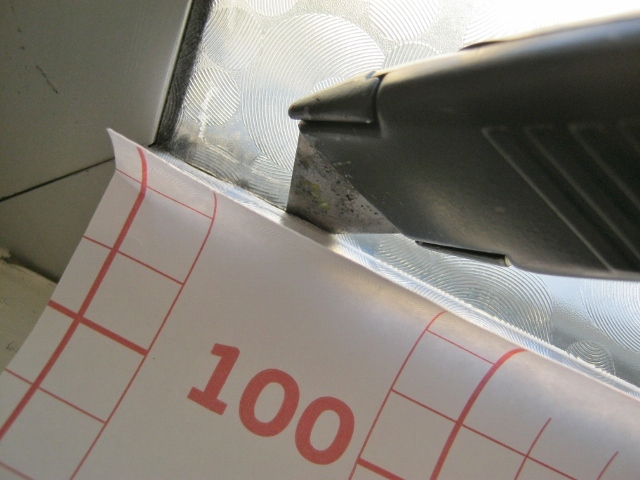 Very important: Using a credit card or plastic scraper, smooth out the vinyl from the center, working outwards on both sides. 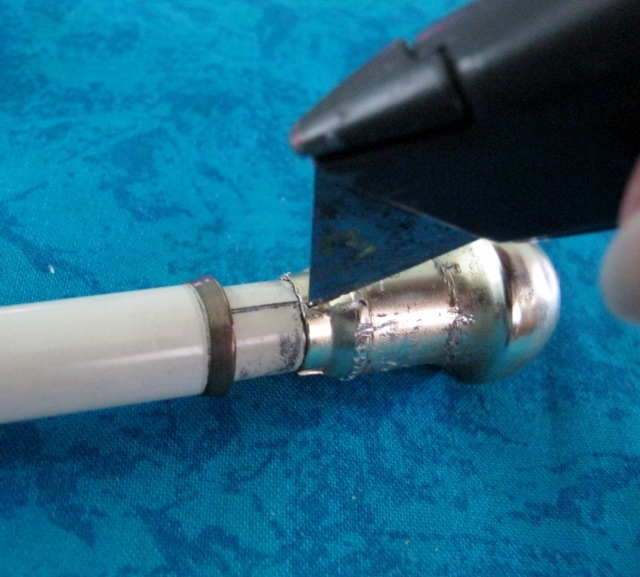 This is to remove air bubbles. 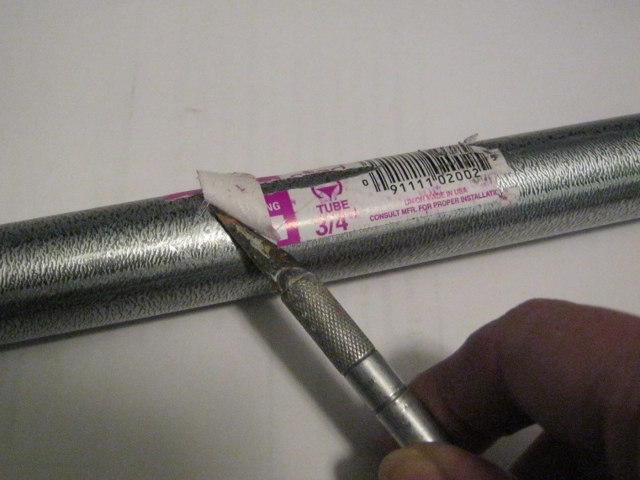 Continue pulling down the paper a few inches at a time, smoothing as you go. 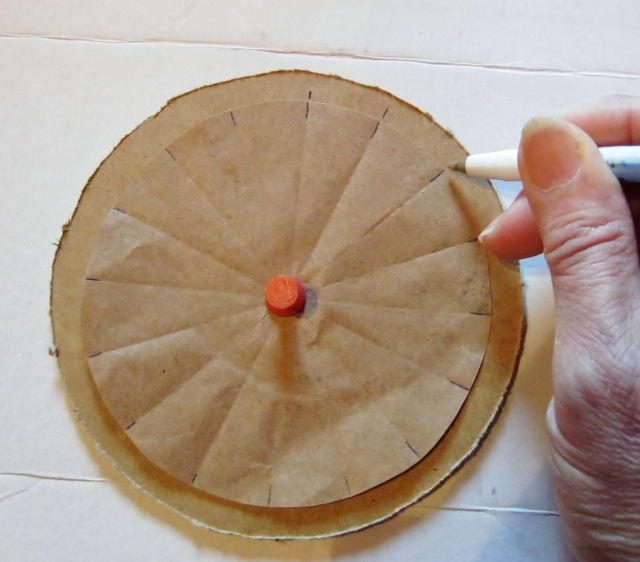 If you make a mistake along the way, you can pull up the vinyl, reposition and continue on. 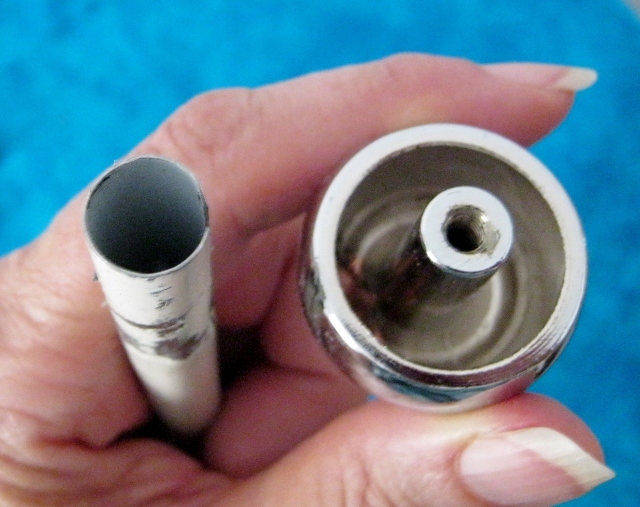 Should you discover some air bubbles after you’re done, simply remove them by sticking a pin in them and pressing the air out with your fingers. 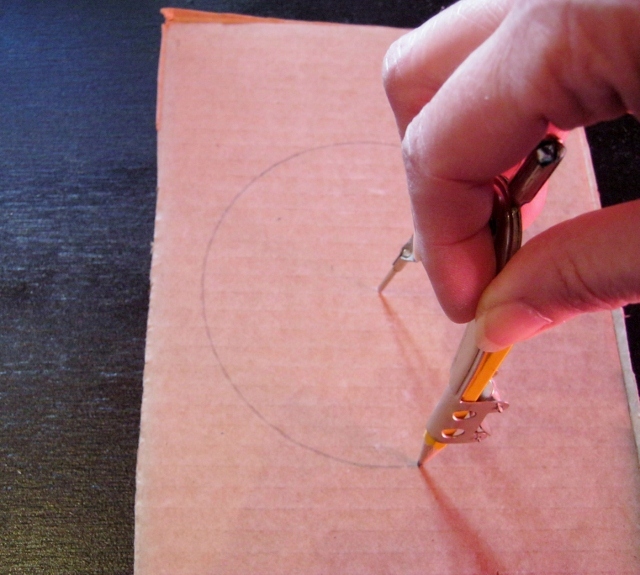 I used a utility knife. Here’s the window with both sides done. There’s a small seam overlapping just a smidgeon down the middle but it doesn’t bother me. It looks at least a thousand times better than it did. With curtains covering up the side windows, I can have total privacy or peek out the windows if I want to without anyone peeking in at me. What bliss! 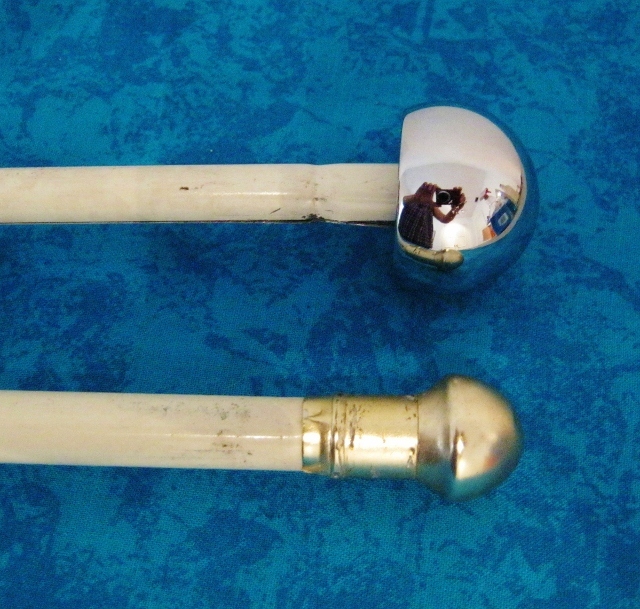 When it comes to curtain rods, it’s all about the finials. 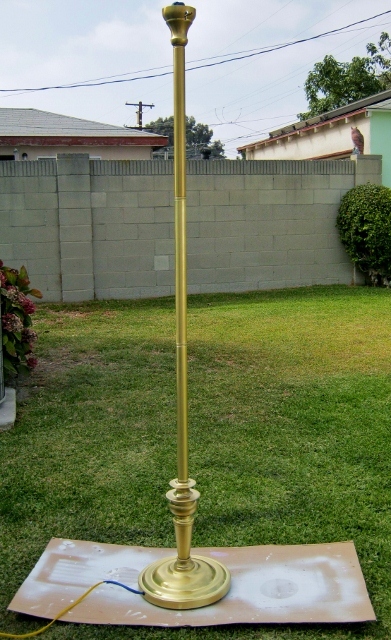 They add style and flair to what would otherwise be an ordinary pole. 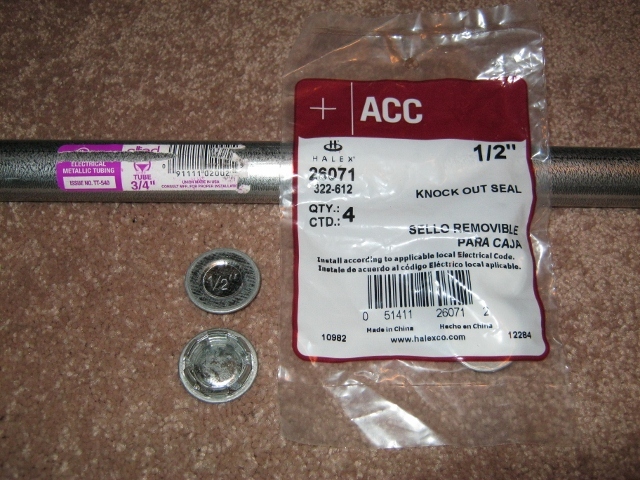 But what if you can’t afford to replace your old curtain rods. 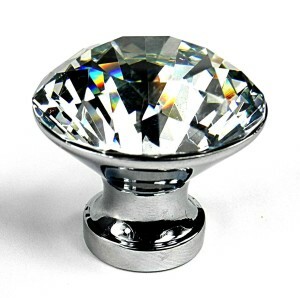 Even just buying new finials can be expensive. So I have a quick and cheap trick for giving a glam new look to old curtain rods. You’ll be saving money and recycling at the same time. 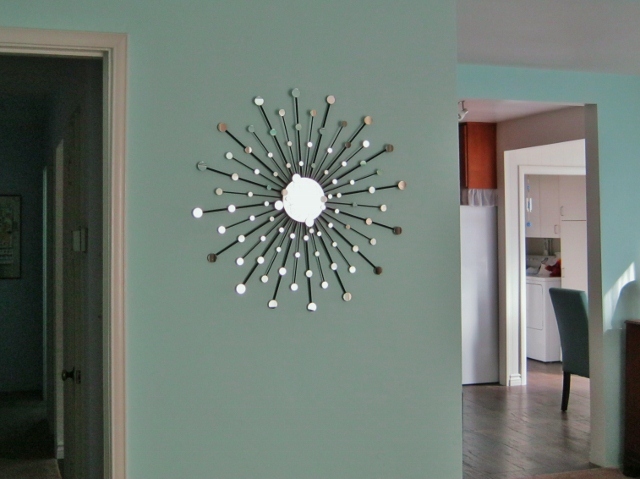 When you’re decorating on a budget, you have to get creative. 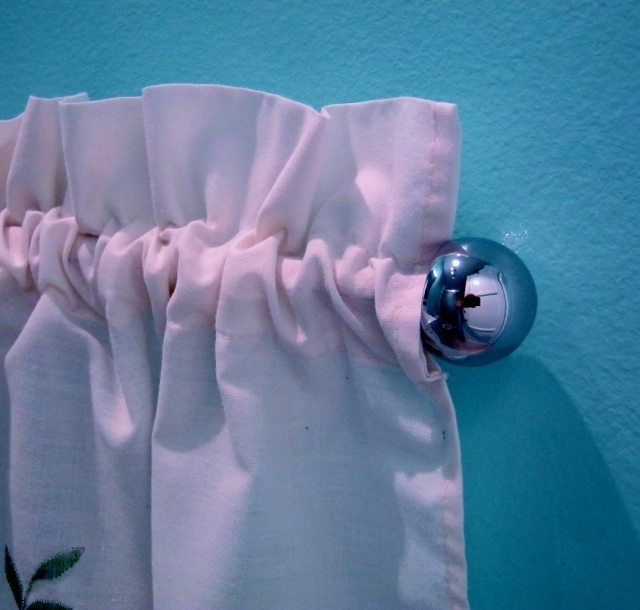 I have quite a few of those basic cafe curtain rods, you know, the kind you get at discount stores. 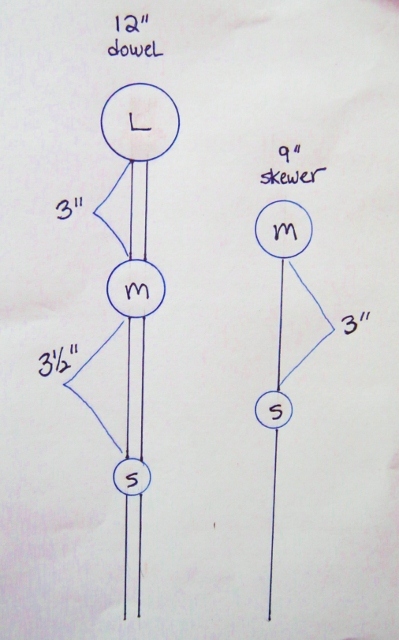 My kitchen is being renovated and those tired old rods don’t fit with my artistic vision. But after shopping for new ones I realized they were actually going to cost more than my new curtains. So then I thought, are those rods really that bad? Maybe I can figure something out. 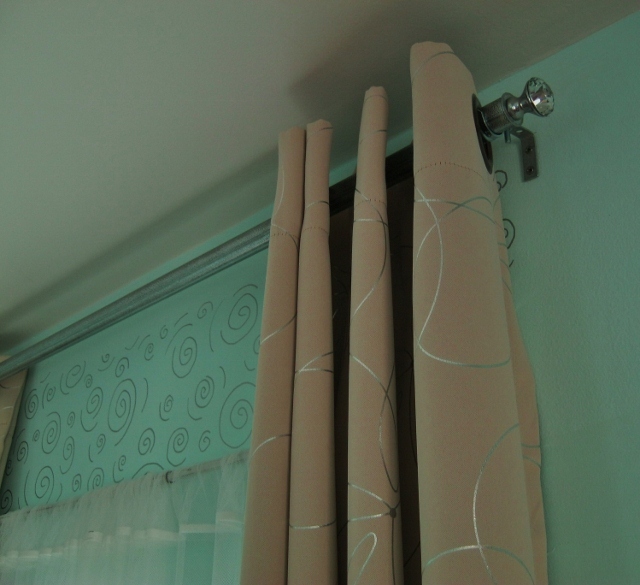 And here’s what I came up with, a simple, fast and cheap curtain rod makeover. 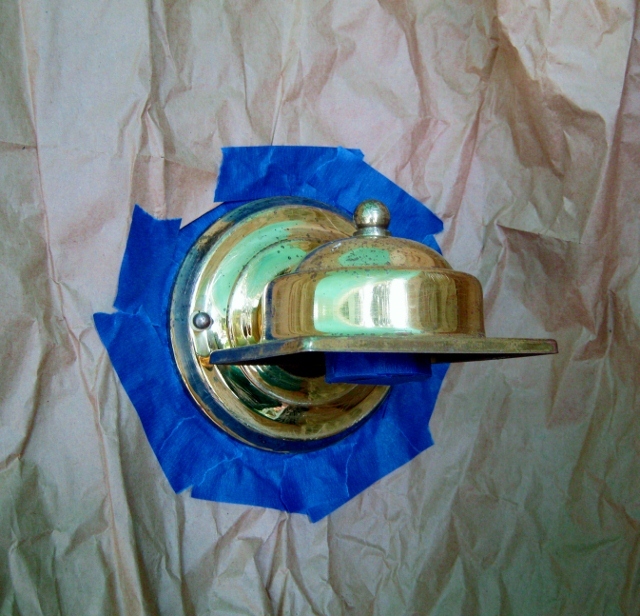 I decided to replace those small ugly brass finials with a cabinet knob. 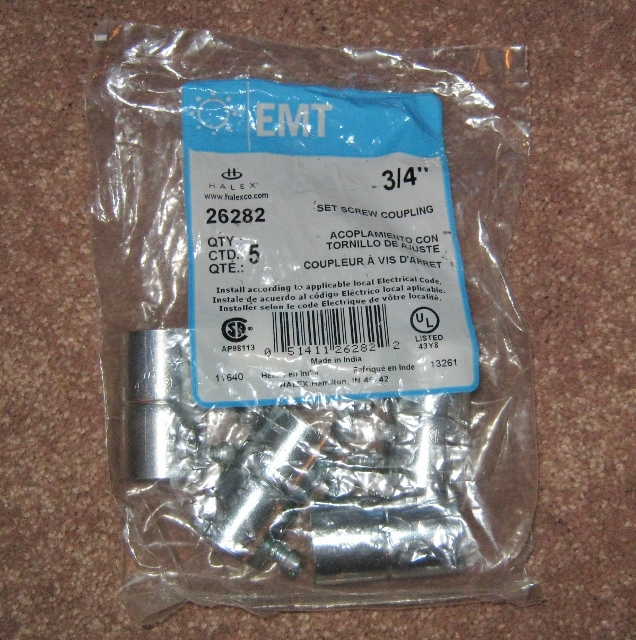 They’re a lot cheaper than finials and there are many to choose from at your local hardware store. These are the ones I selected. They were $2.50 apiece and I needed four of them. That’s a total of $10 for “new” rods. 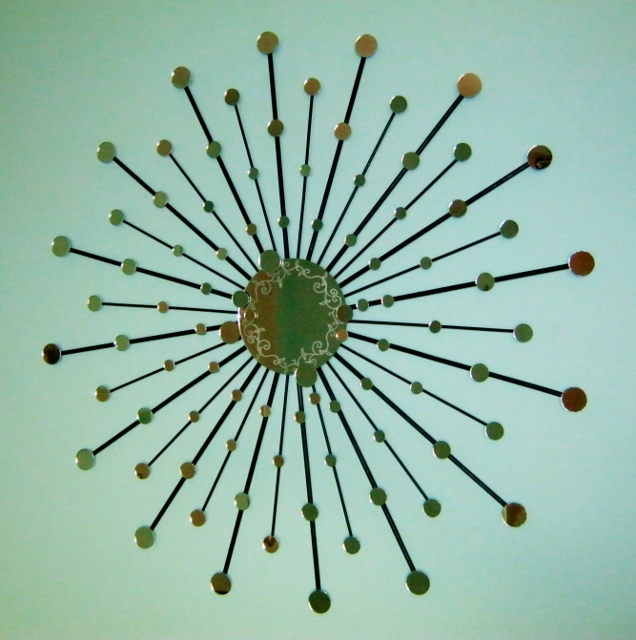 I think they’re going to look fantastic with my new retro modern chandelier. 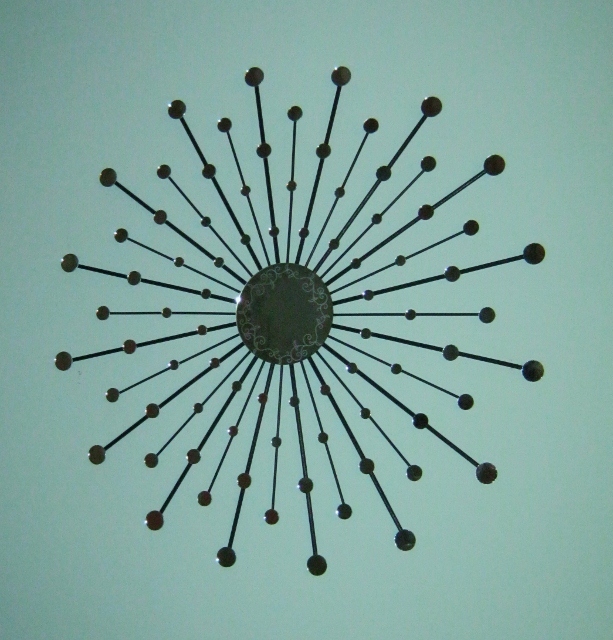 The round silver cabinet knobs echo the design of the chandelier. 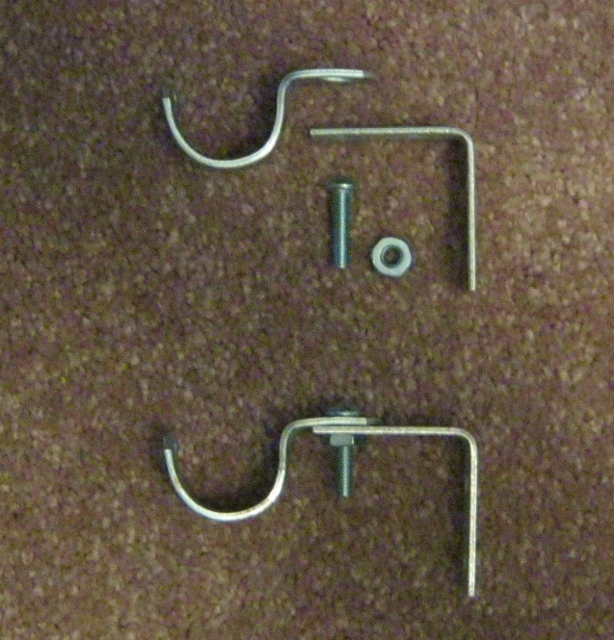 There are two ways to replace the finials. 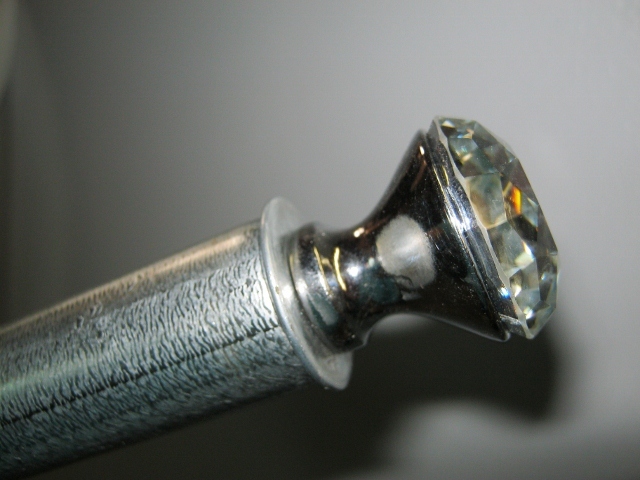 You can either remove the old finial or leave it on and use it as a base for the new finial. 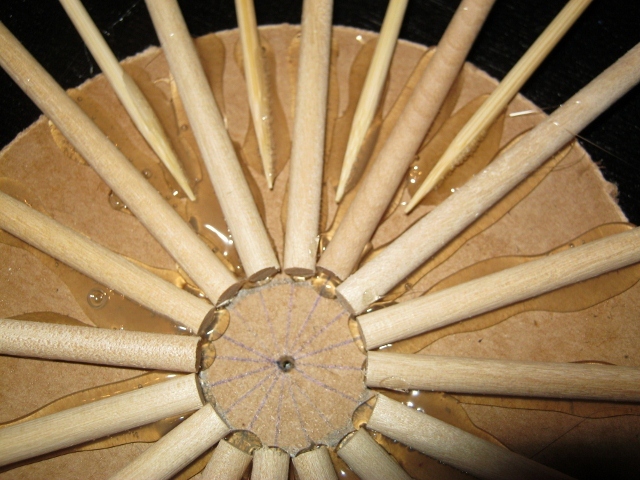 The method you choose depends on the size of the knob you’re using and how well the base will fit into the rod. 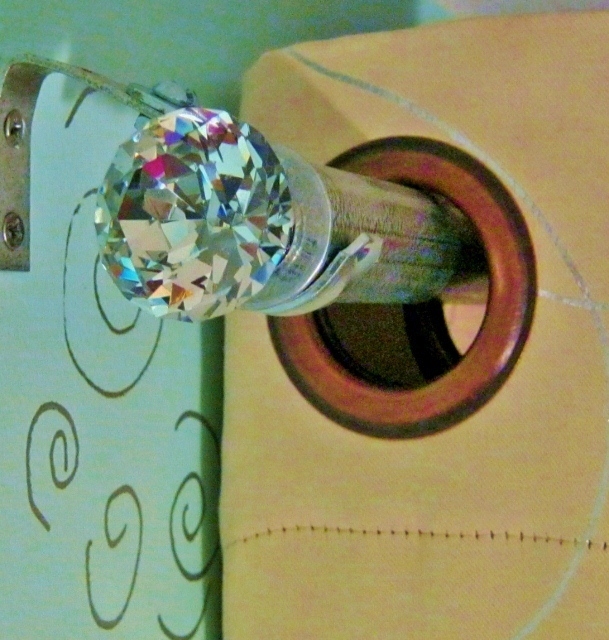 The best scenario is to choose knobs that will fit inside the rod pretty snugly. 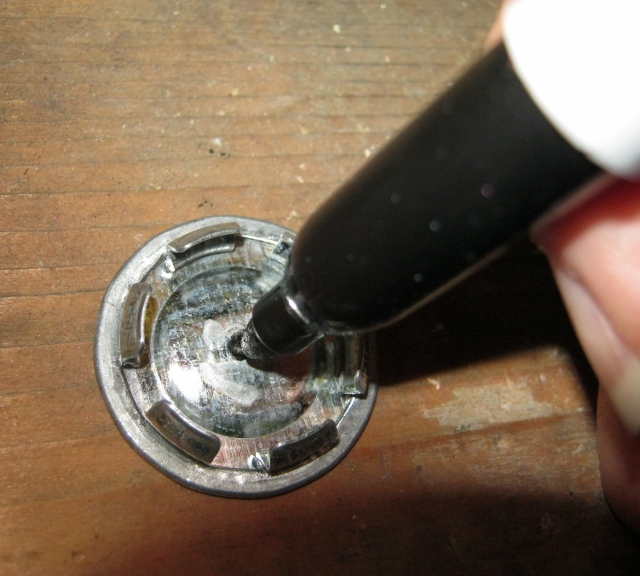 In that case you need to remove the old finial as outlined in Method 1. 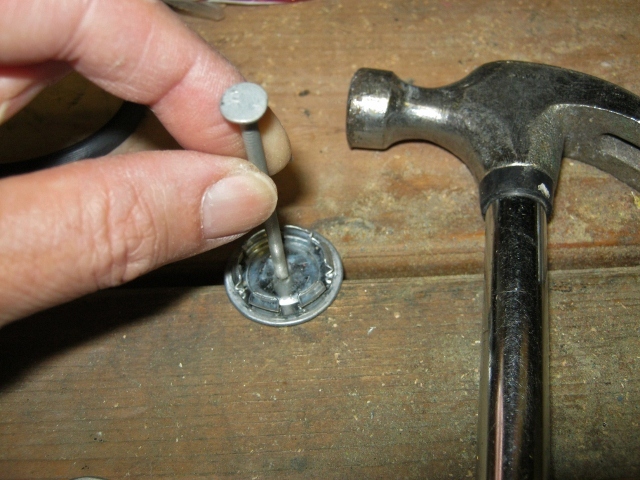 For knobs that will be either too large or too small to fit inside the old rod, please refer to Method 2. 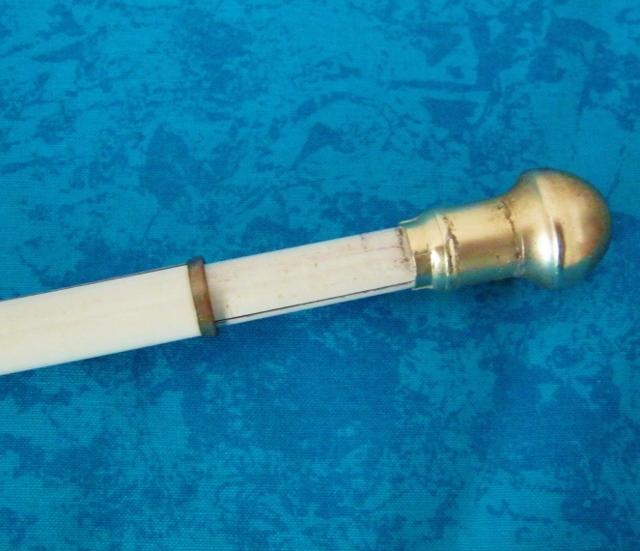 I discovered that brass finials are just clamped onto the end of the rod. 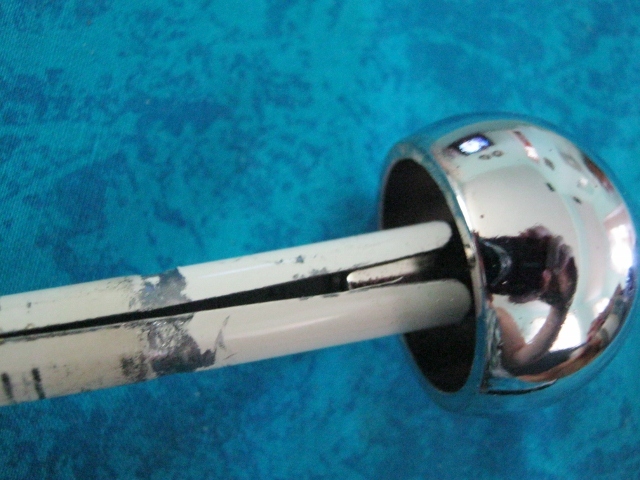 The rod extends all the way inside the finial. 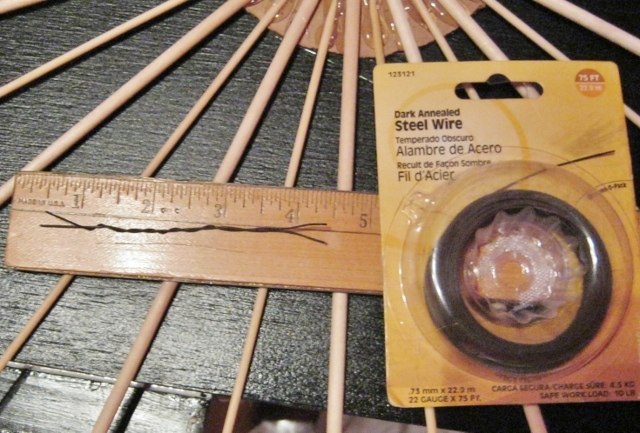 With a bit of effort you could actually pull them off but you risk twisting and warping the rod. 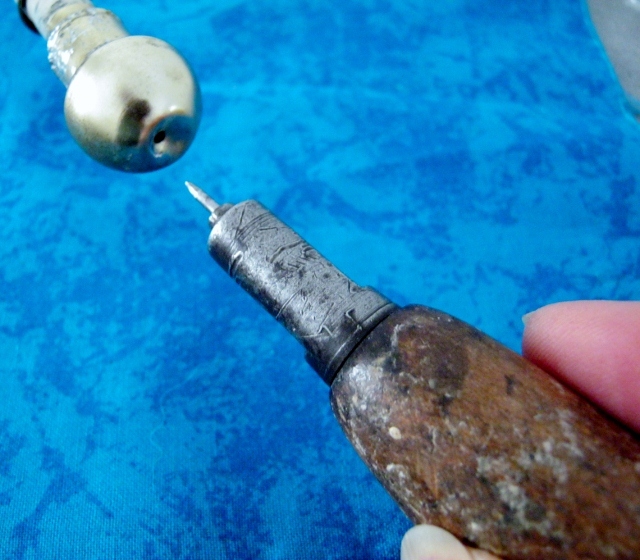 The best and fastest way to remove the old finial is to cut it. 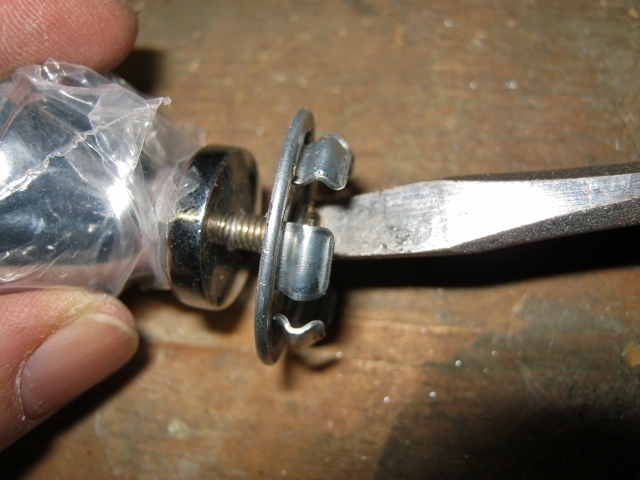 Find the seam in the rod, take a utility knife and start cutting through the finial. 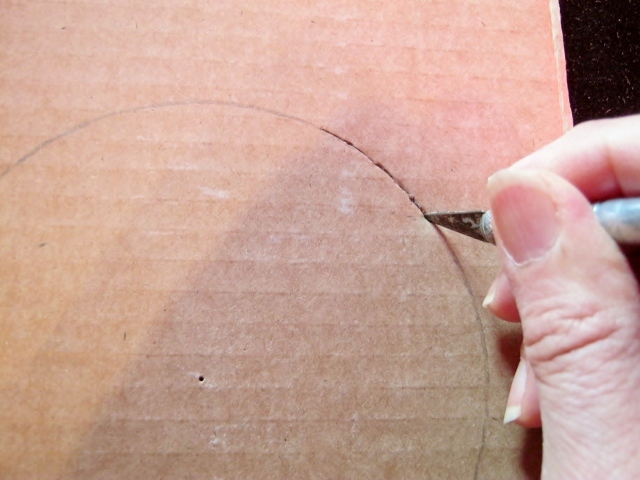 Keep cutting until you can get the utility knife in to pry up an edge. 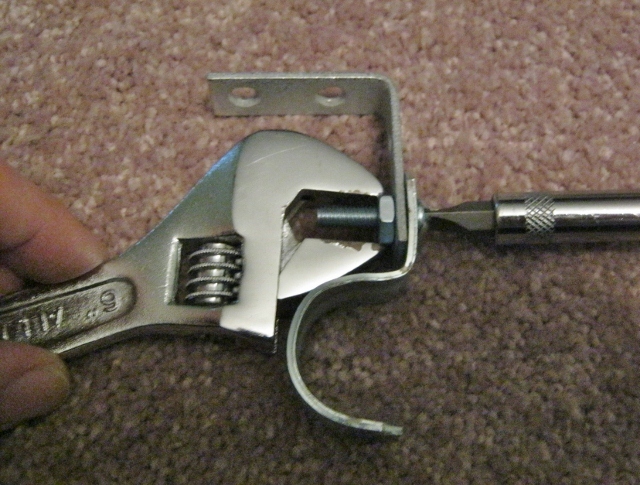 This is similar to opening a sardine can. 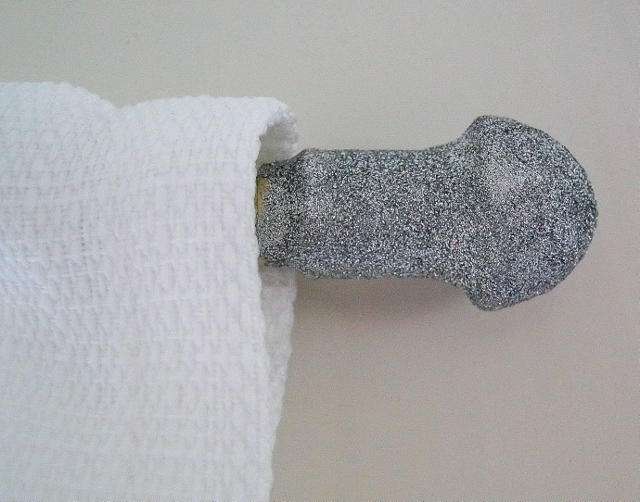 After you’ve peeled a bit of the metal back, the old finial will just come right off. The whole process takes about five minutes. 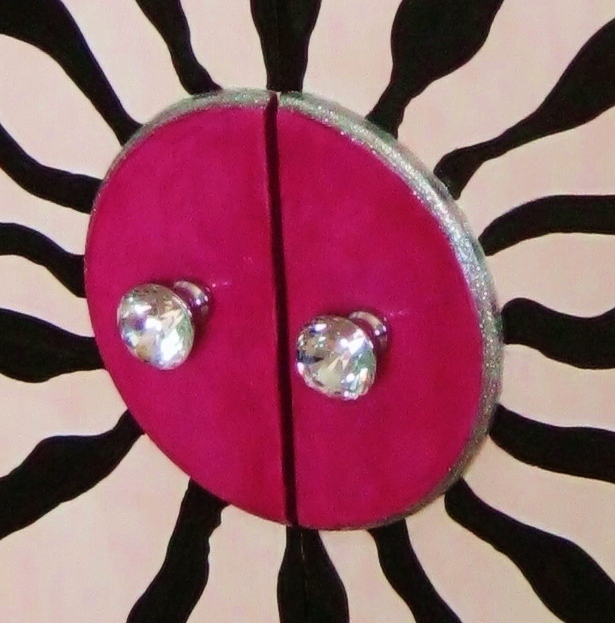 The knobs I chose are a pretty close fit. 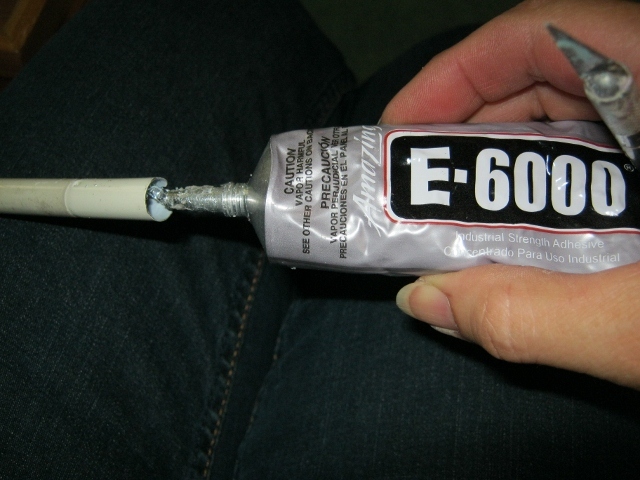 Put a little E-6000 inside the rod, a good glue for nonporous surfaces. 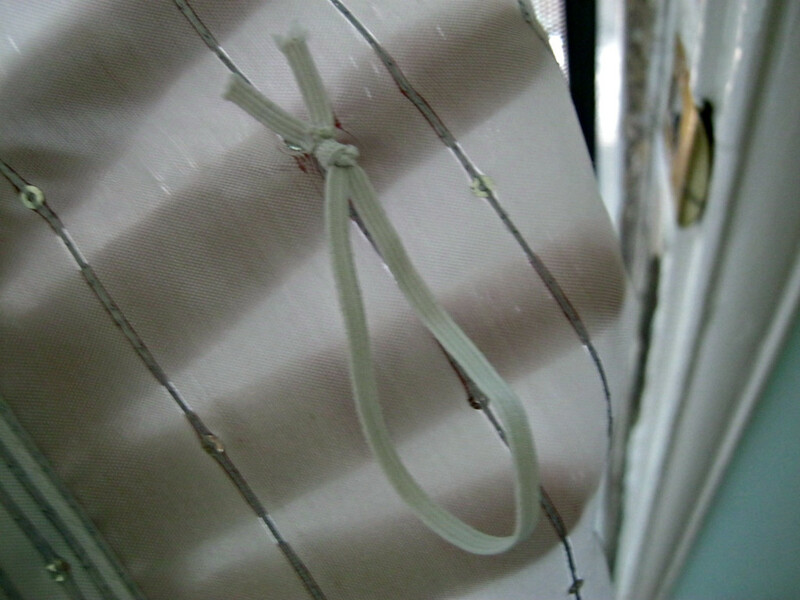 This step ensures the finials will not pop out. 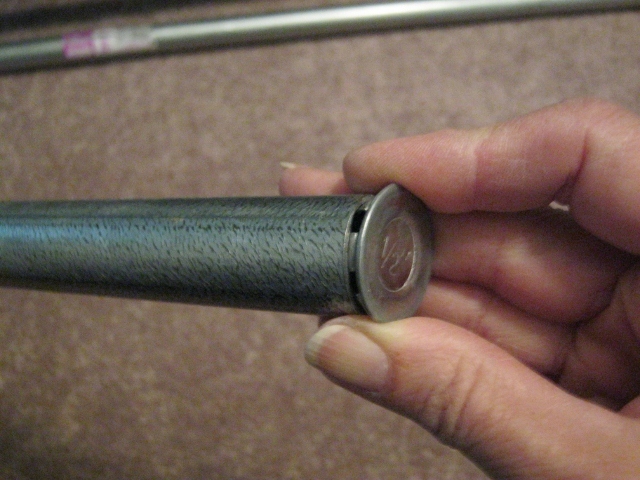 You can see some of the paint is gone near the end of the rod. 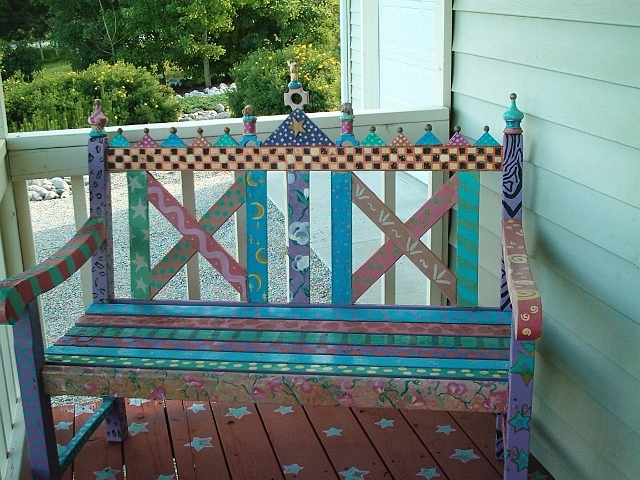 If that bothers you it can be touched up with some enamel paint. Let it dry and cure per the instructions on the product. I’ve decided not to do that because the curtain will completely cover up that spot. 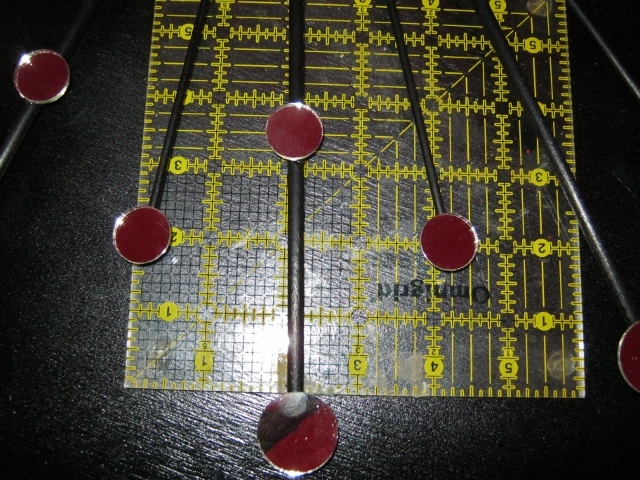 Let the knobs dry overnight by standing the rods up in a corner. 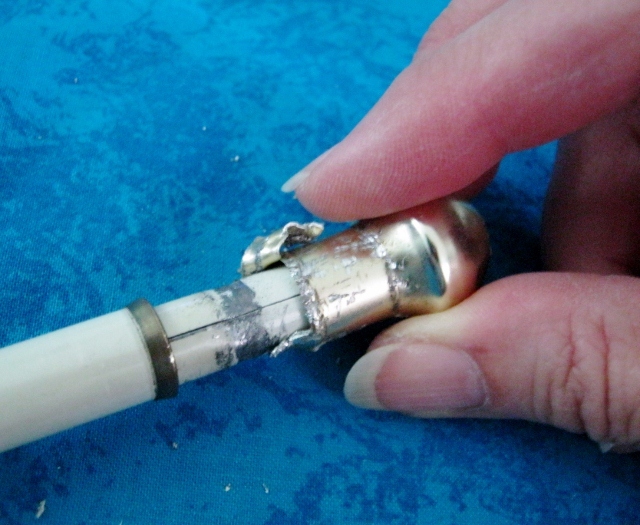 Any excess glue that oozes out will go down inside the knob. The new finials have a lot more impact. 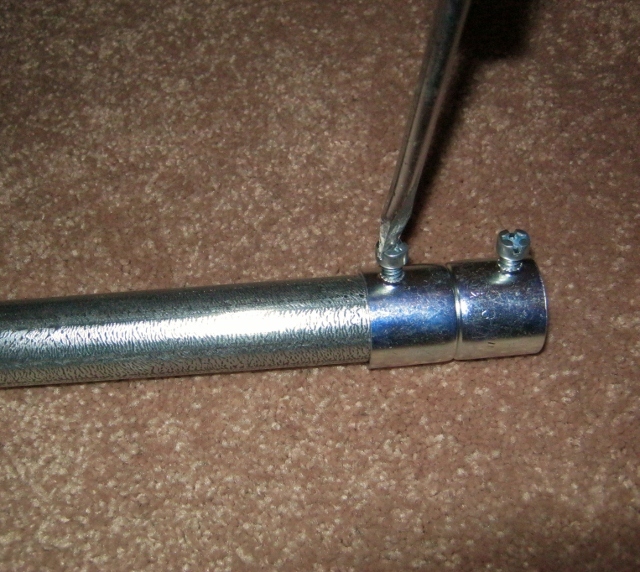 You may find knobs that are too narrow at the base to make a tight connection inside the rod. 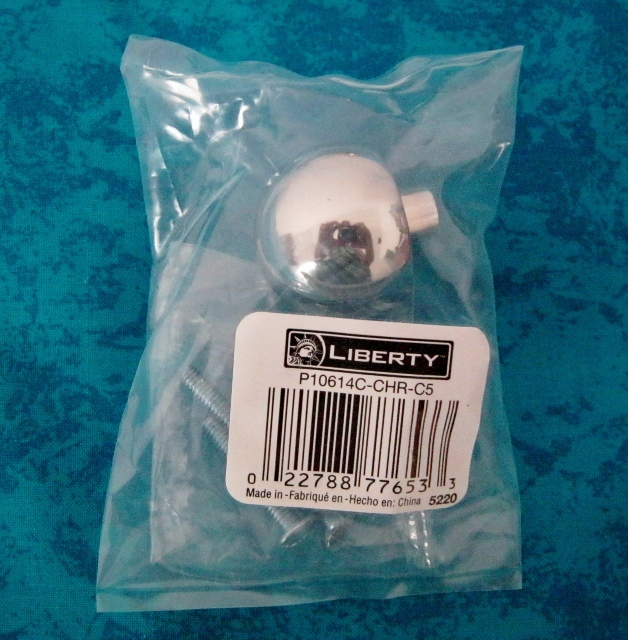 In that case you can make an appropriately sized hole in the old finial for the knob to fit into. 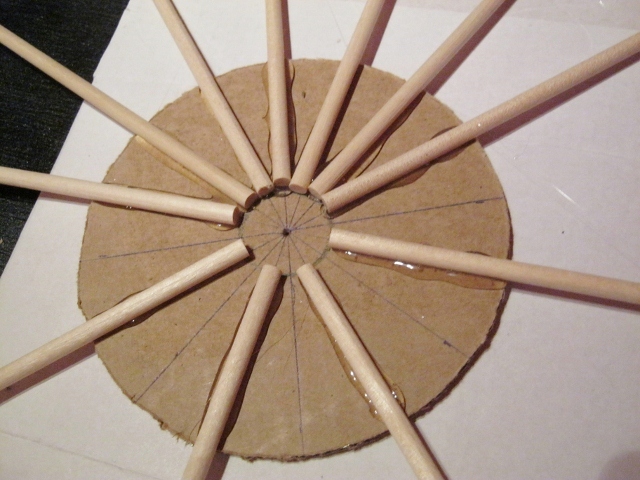 This will also work in situations where the base is much bigger around than the rod. 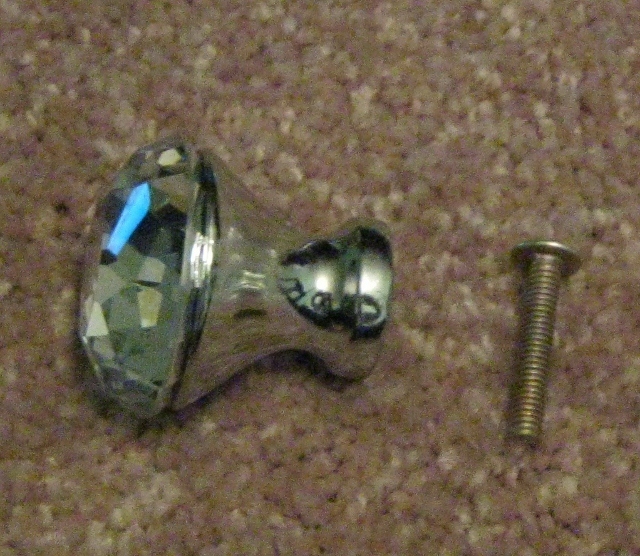 Take the screw that comes with the knob and screw it into the bottom. Then make a hole in the finial to fit the size of the screw. 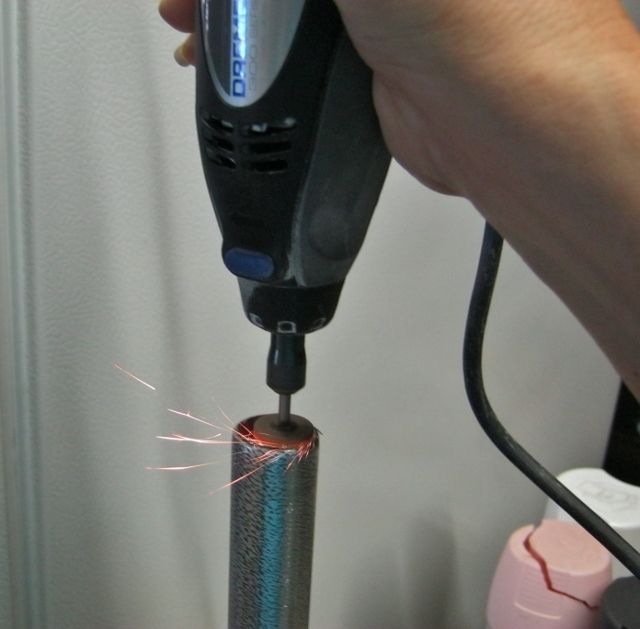 The metal is thin so this is easy to do. 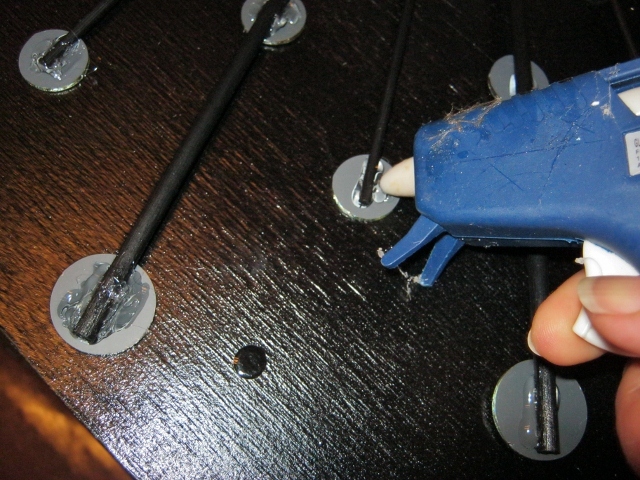 Then you would take the new knob and put glue around the base (or the screw if that’s being used as a post). 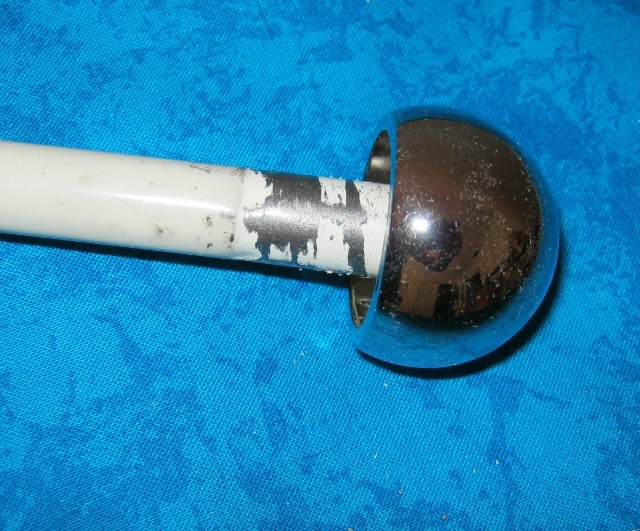 Insert new knob into the old finial. Let dry overnight. 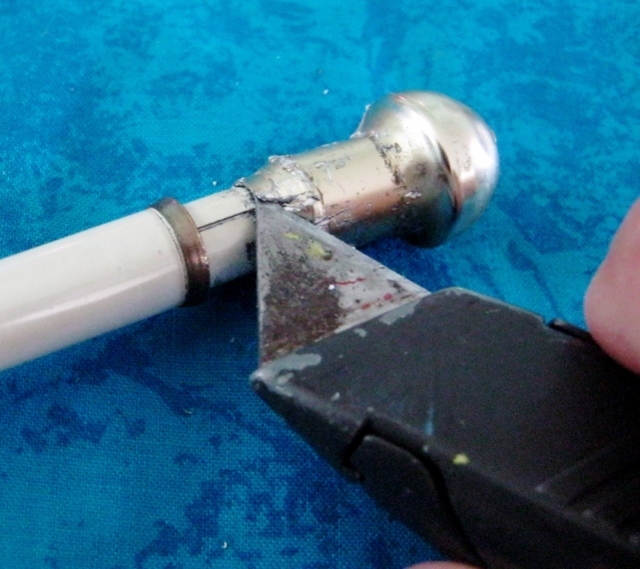 Here’s an even easier way to change the look of an old cafe rod with paint and glitter. I painted the brass finial with silver metallic paint and while it was wet dipped it into microfine silver glitter (‘cuz that’s how I roll). After the glitter dried I brushed on two coats of Delta satin varnish, drying in between coats. 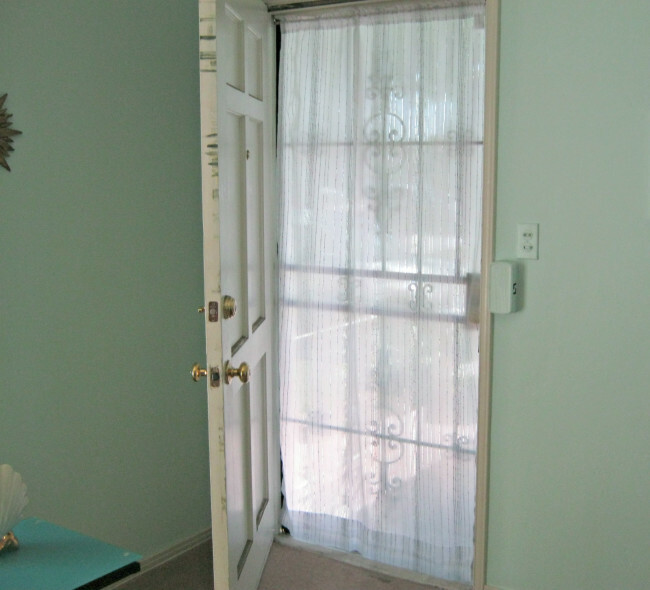 And there you have it, curtain rod glam makeover complete! I’m really happy with the look. Now I just need to get my new curtains.